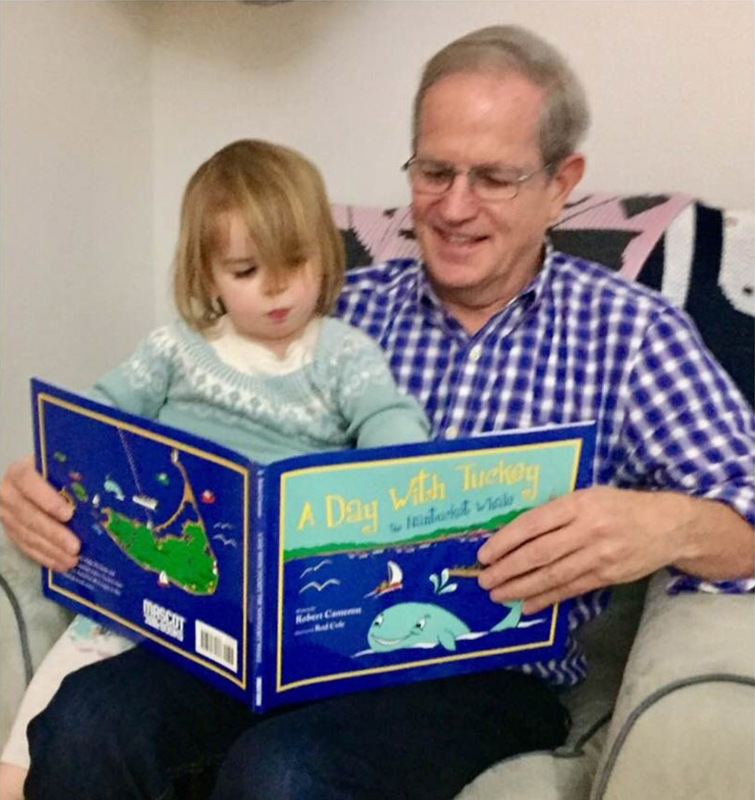 Young readers, parents, and grandparents have loved and enjoyed reading the stories and adventures of Tuckey The Nantucket Whale. Here are some of our favorite reviews. 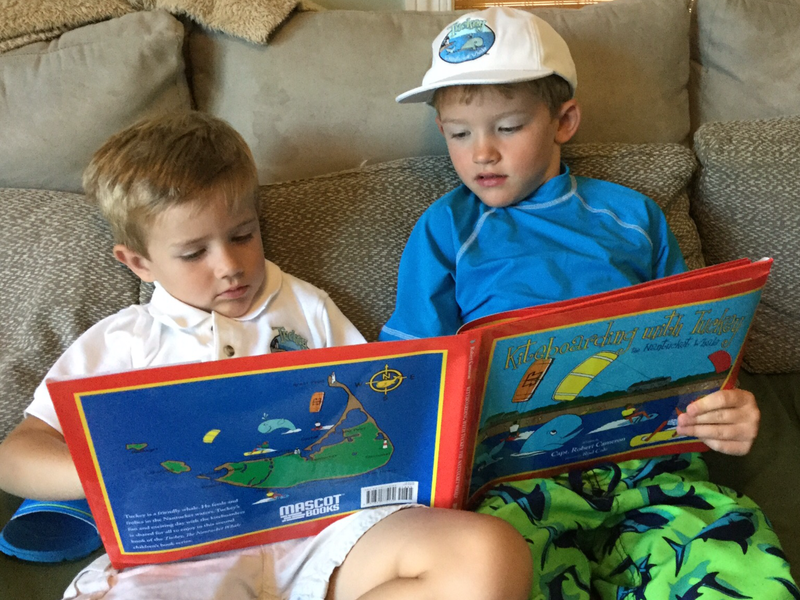 PS my grand boys LOVE the Tuckey books! We’ve bought them all for them! 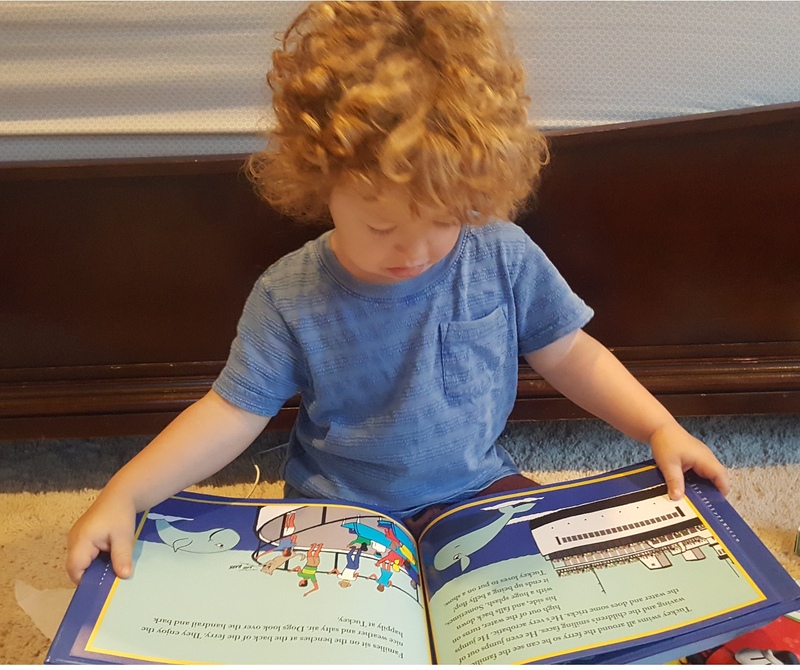 A Tuckey book made it to Missouri! Gregg’s Iii cousins enjoying Capt. 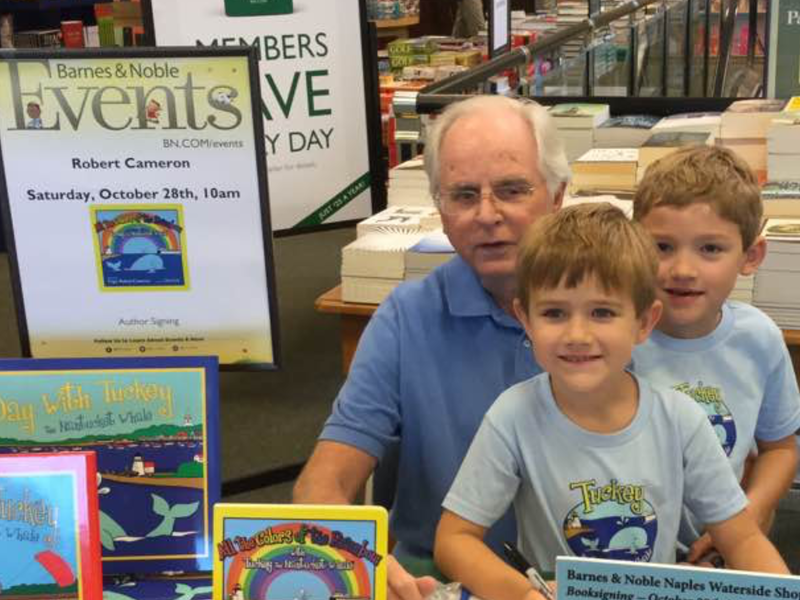 Robert Cameron’s book, Tuckey, the Nantucket Whale Around The World! Thank you, Bob, for autographing this book for the girls! Go Tuckey!!!!! 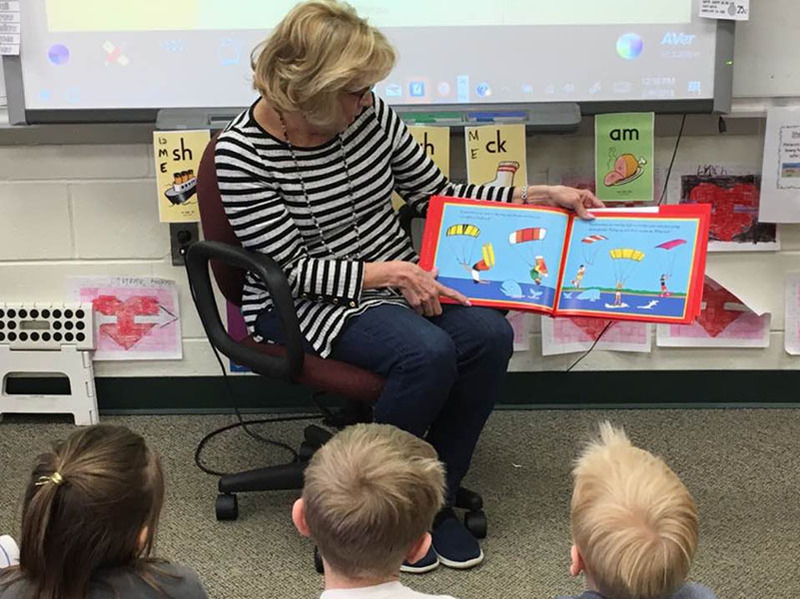 Read another Tuckey book to my granddaughters 2nd grade class. 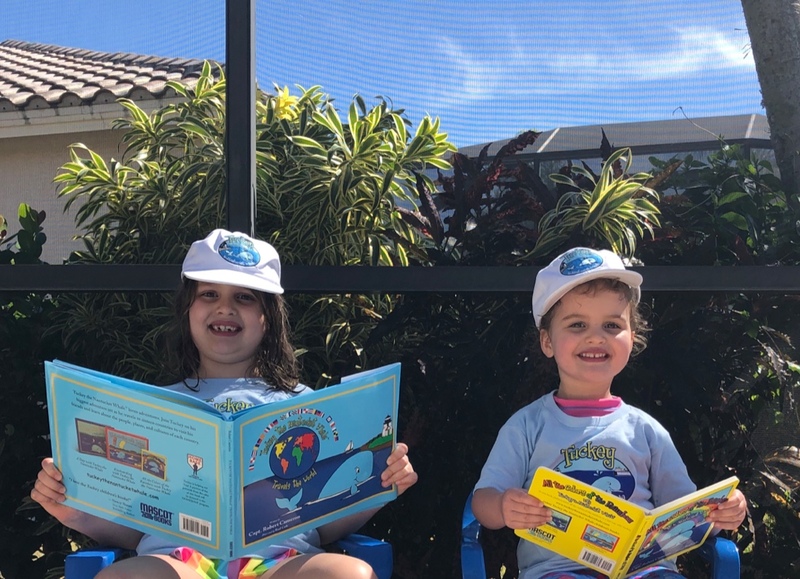 Tuckey the Nantucket Whale Travels the World’ They loved it. Thank you Capt. Robert Cameron for writing such great stories. Looking forward to your next one! 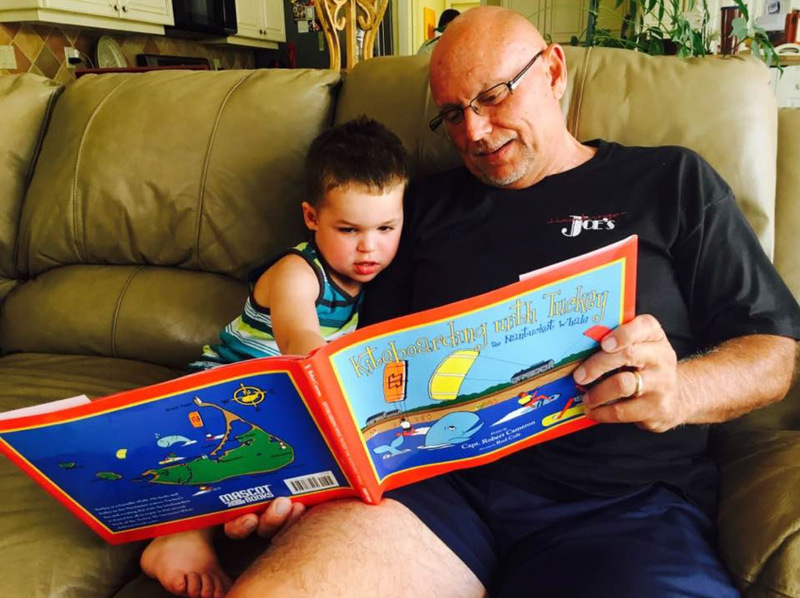 Fun time……reading his Tuckey books to Grandpop! 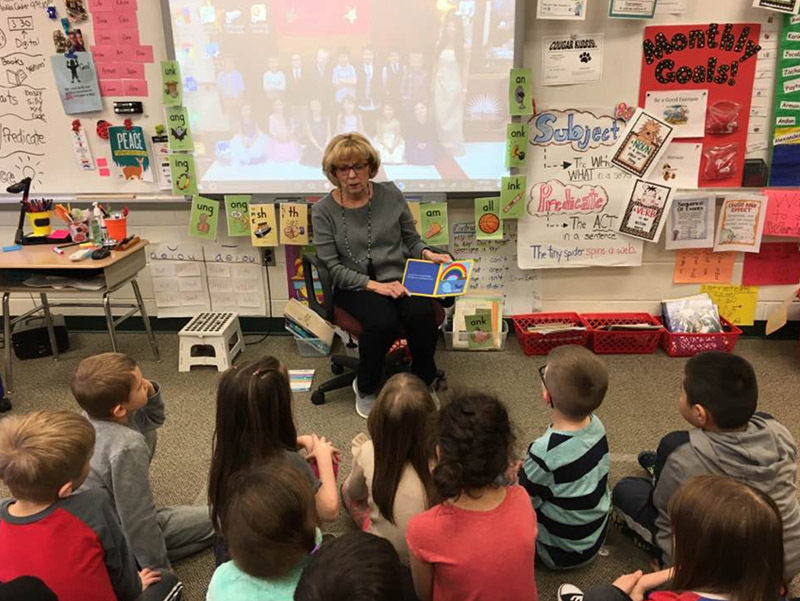 Reading A Day With Tuckey to Kennedys 1st grade class. The kids love these books. Thank you so much for writing them Robert Cameron. Our favorite author Captain Robert Cameron writes the best children’s books!! Tuckey the Nantucket Whale!! 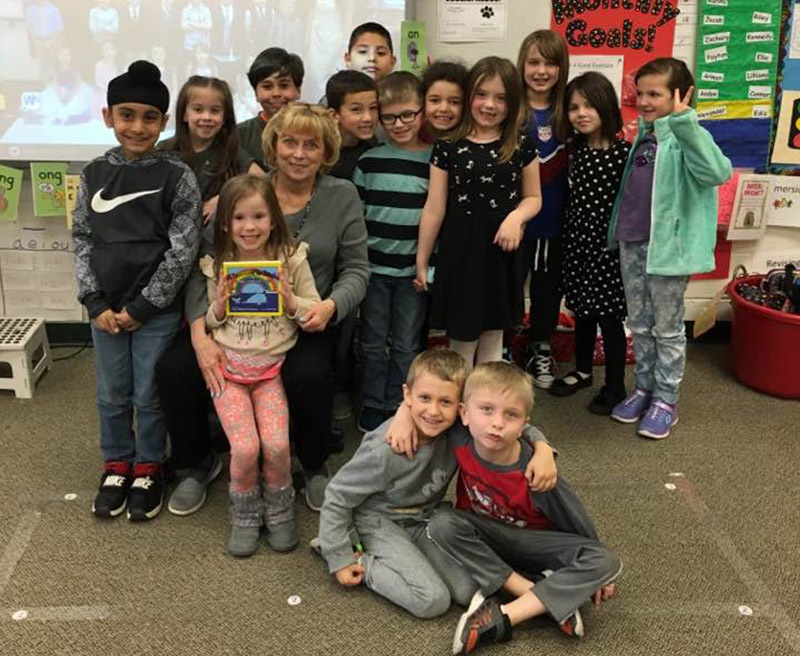 This Indonesian Class loves Ms. Kalpu reading a Tuckey book to them! James enjoying the Tuckey book we just brought back from Florida! Wow! What a super note from over 1300 miles away in Bismarck, Missouri! Thank you so much Mrs. Chamberlain to you & your class for those awesome colorings and letters! 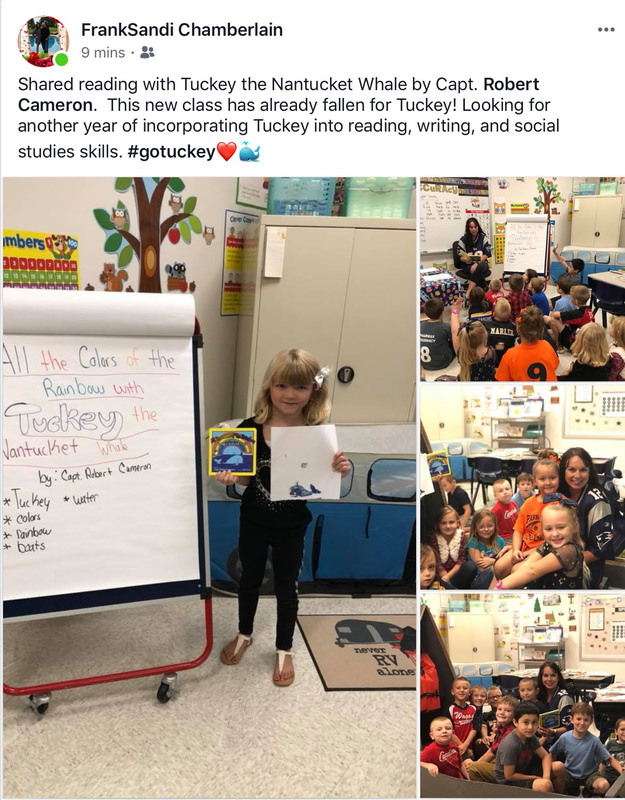 Go Tuckey! Everyone loves Tuckey the Nantucket Whale! 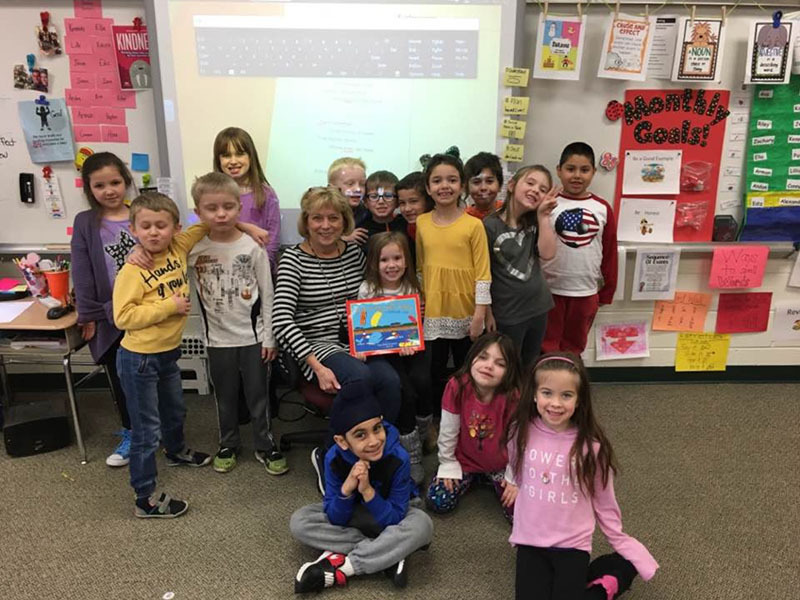 Ms. Sandi & her class love Tuckey and can’t wait for his new book! 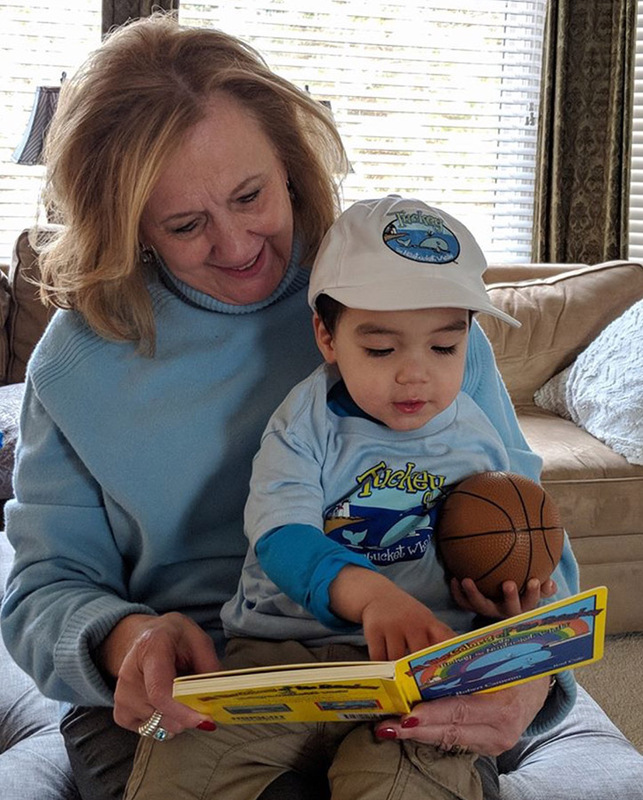 Oliver all decked out with his Tuckey Cap & tee shirt, reading his new Tuckey book with his Nana. Go Oliver! Go Tuckey! Tuckey loves this place! 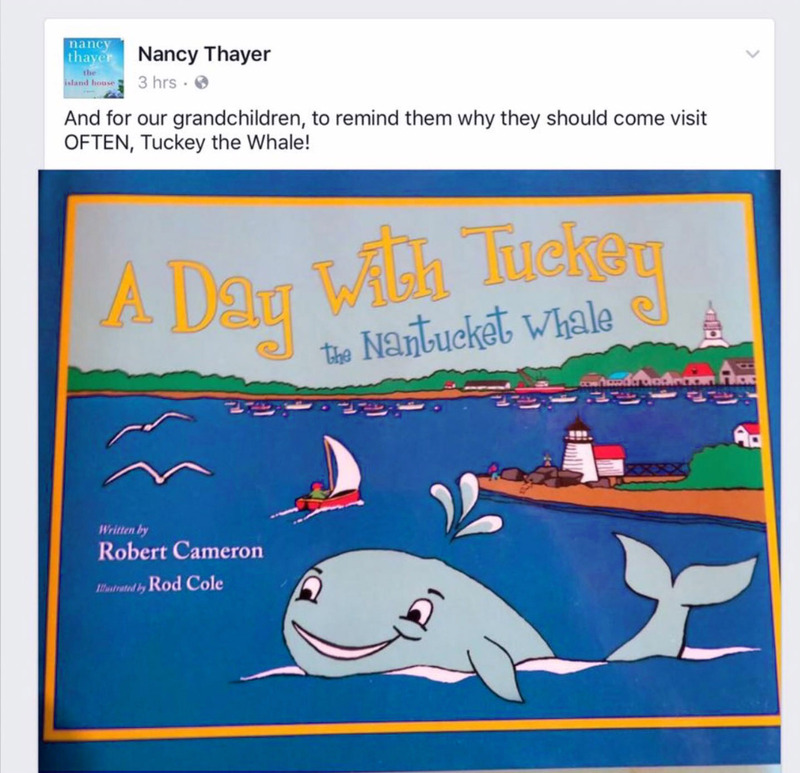 His Tuckey the Nantucket Whale children’s book series is here for all the children to enjoy! 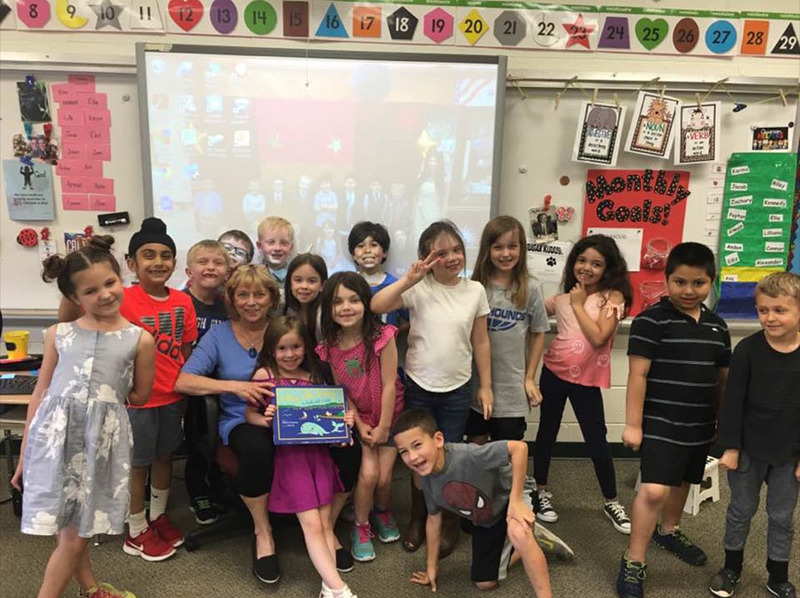 Kids love Ms. Cynthia read Tuckey Books to them! Go Tuckey! 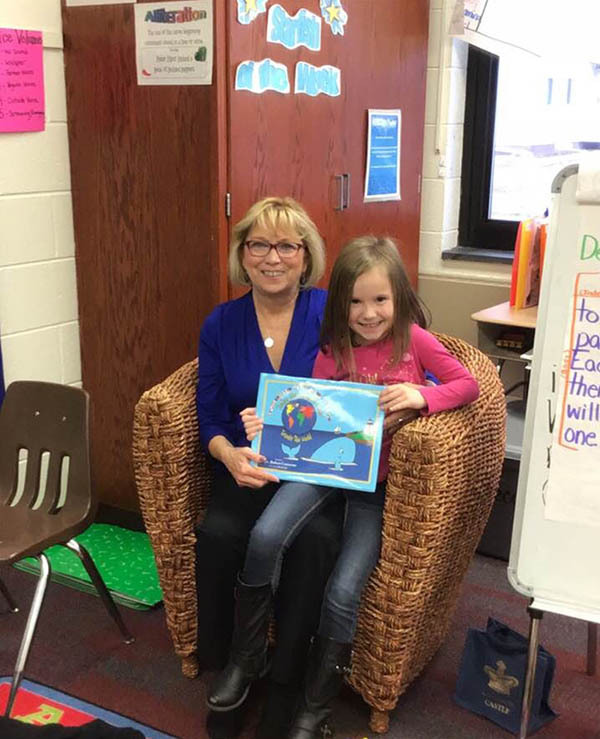 Ms. Cynthia’s granddaughter loves her reading Tuckey Books to her class! Go Tuckey! 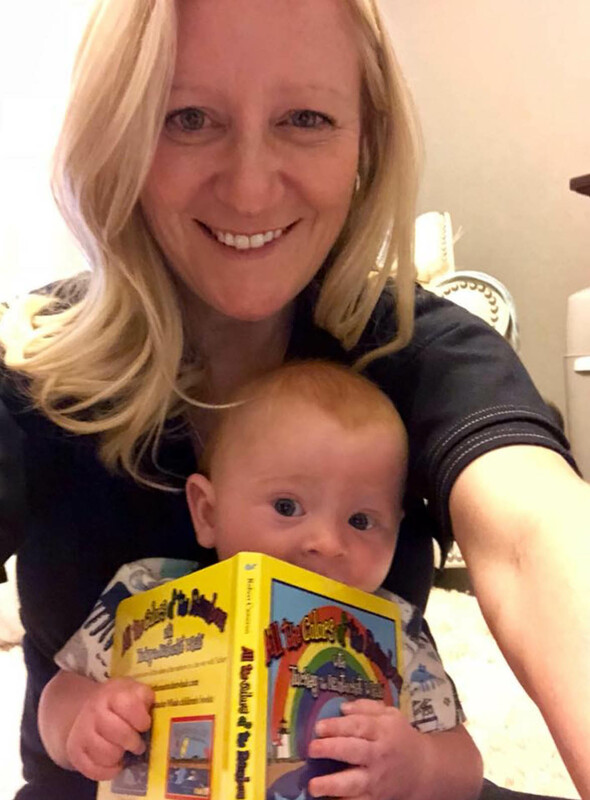 Tuckey’s books are great for reading—and tasting! 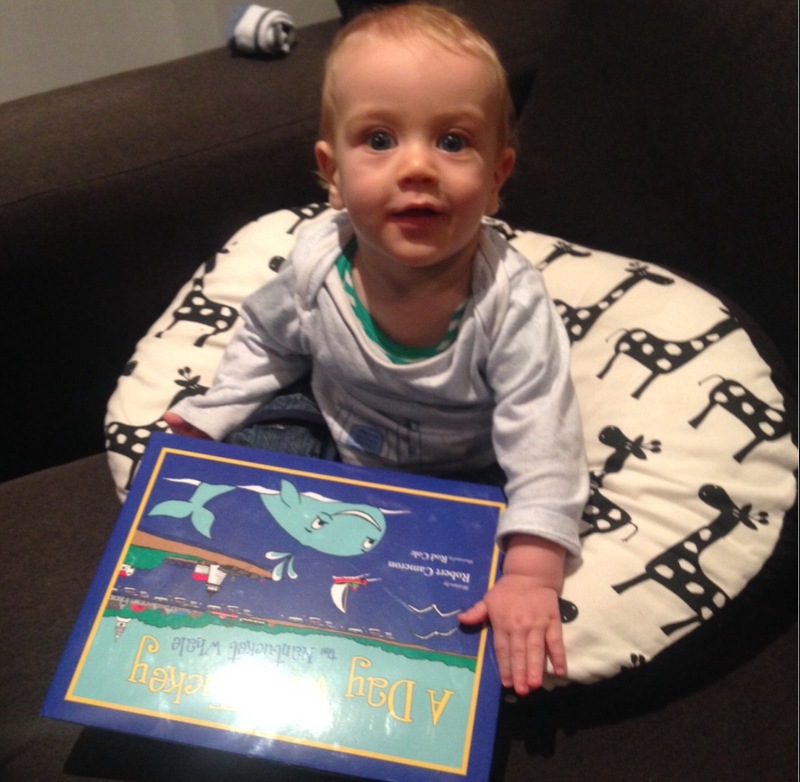 #LilHenry loves Tuckey the Nantucket Whale! 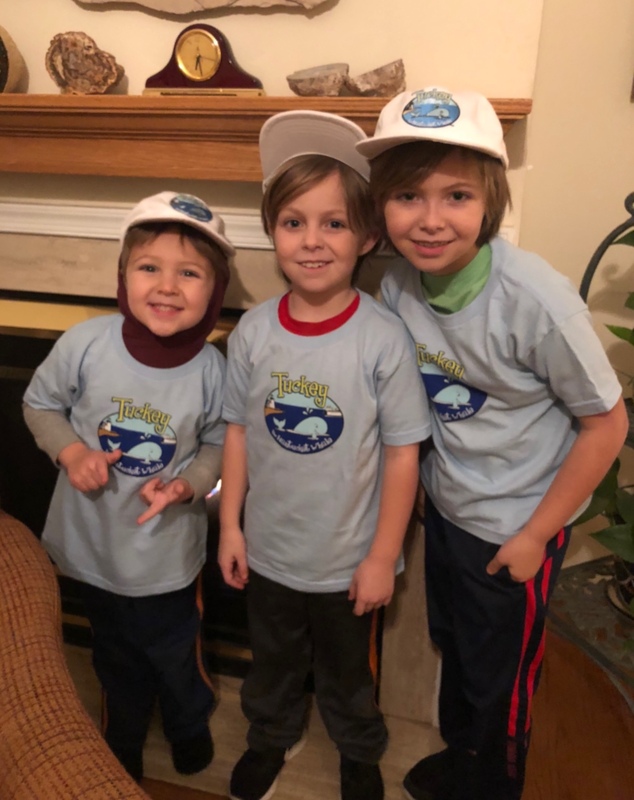 Another bunch of happy Tuckey Fans! Everyone loves Tuckey! Go Tuckey! 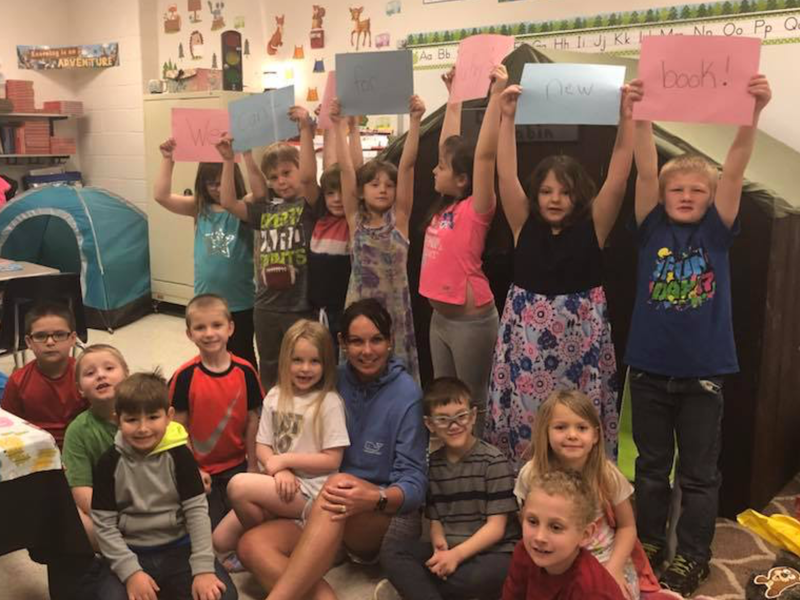 Kennedy & her class loved the Tuckey book! Reading a new book Kiteboarding with Tuckey. What a wonderful book … need to get another one to read to them in the spring. Thank you Bob Cameron. Tuckey the Nantucket Whale made it to our classroom all the way from beautiful Nantucket. My students fell in love with Tuckey. 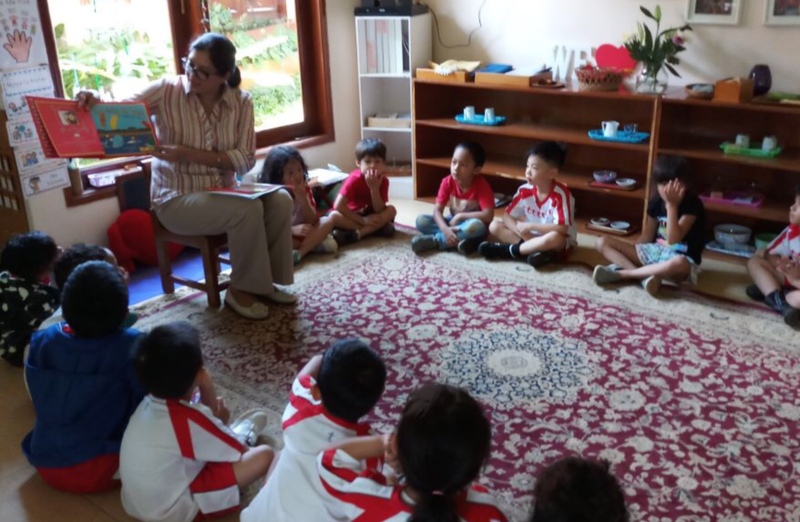 They enjoyed listening to Tuckey’s adventures around the island. I bought the two Tuckey books for the girls (2 & 4) who love them. They are not allowed to watch TV and are book-aholics. They probably have them memorized by now. I see there is a third Tuckey book, and I will order it as well. Do you have others in the works? What a great thing to be doing! I am sure it brings lots of joy to kids…..and you! 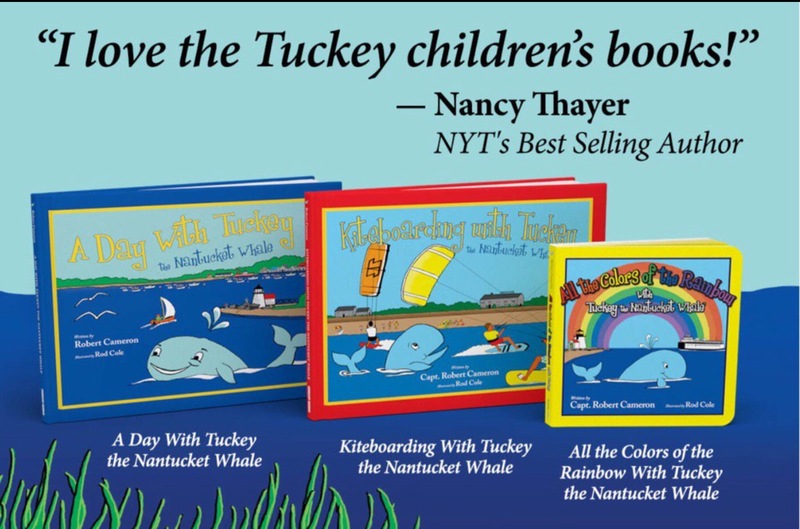 I don’t want my IPad, Wii, Nintendo…..please just give me my Tuckey The Nantucket Whale books to read! Love my Tuckey Books! 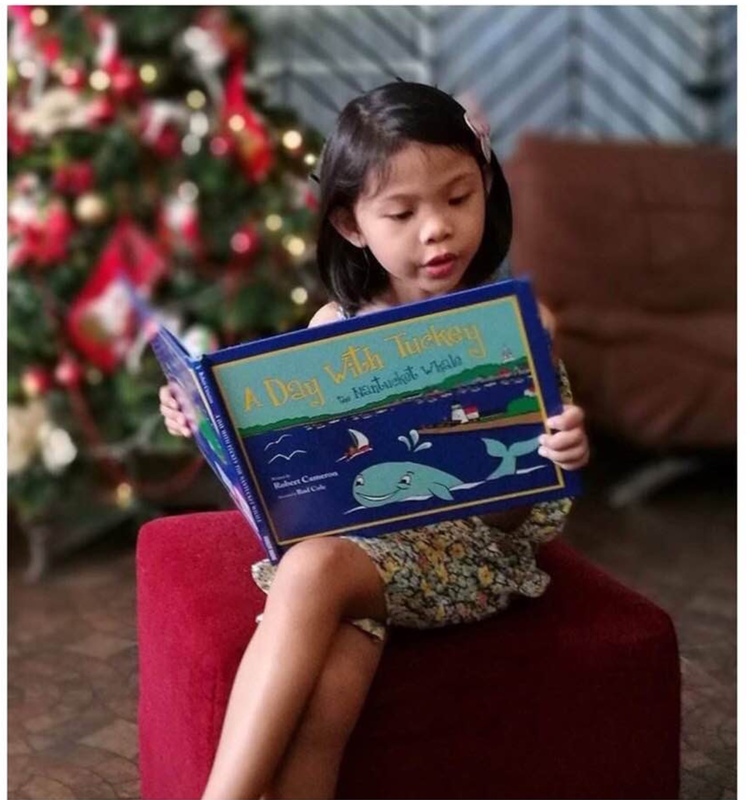 If you are looking for a gift for the little ones in your life, check out the Tuckey The Nantucket Whale books! Julian loves them! Beautifully Written With a Wonderful Message! My four children ages ten, nine, seven and five all love this book! It is beautifully written and the illustrations are truly amazing! If you have ever been to Nantucket or wish to someday visit this is a perfect book for your family. 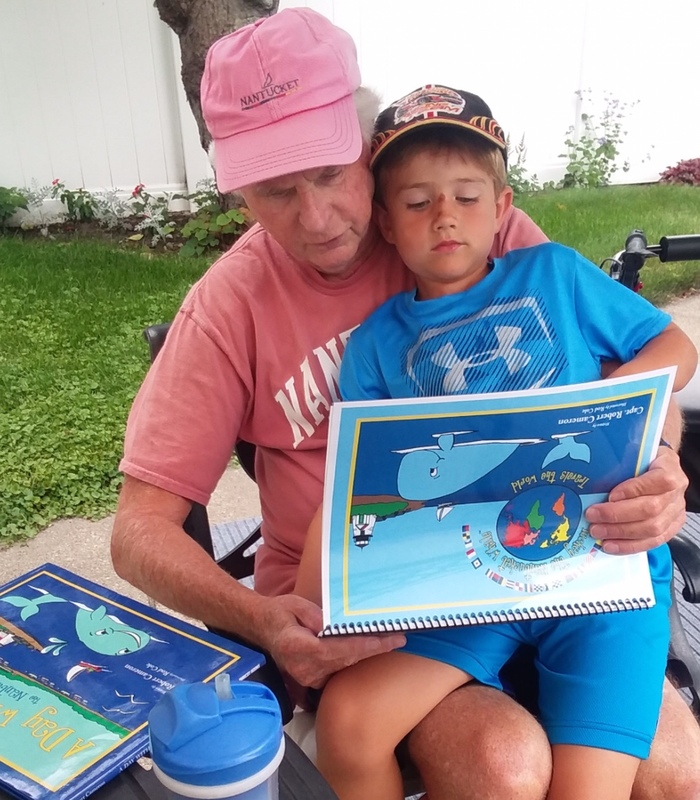 A Day with Tuckey the Nantucket Whale is a lovely book with a wonderful message. I highly recommend this book you will not be disappointed. I cannot wait to read future “Tuckey” books! 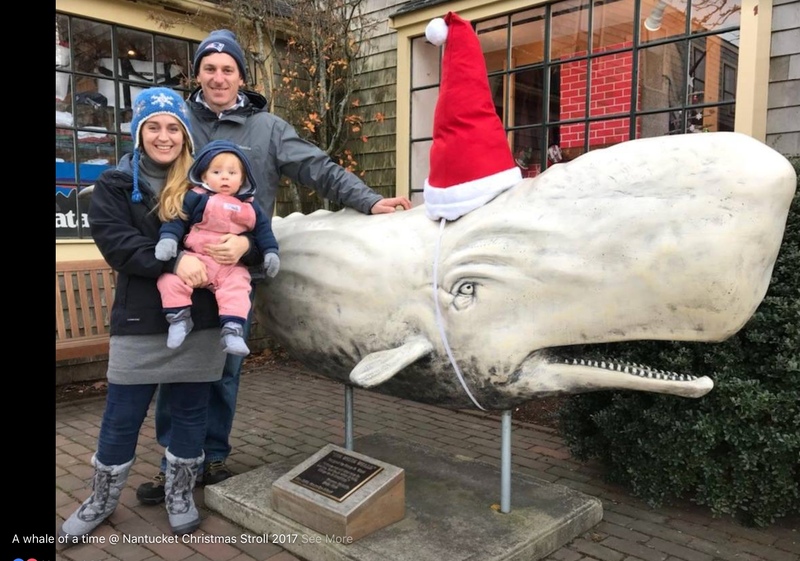 As you ’round Brant Point Lighthouse this summer, you might spot a friendly, blue whale frolicking in the sparkling waters of Nantucket Sound. Meet Tuckey! 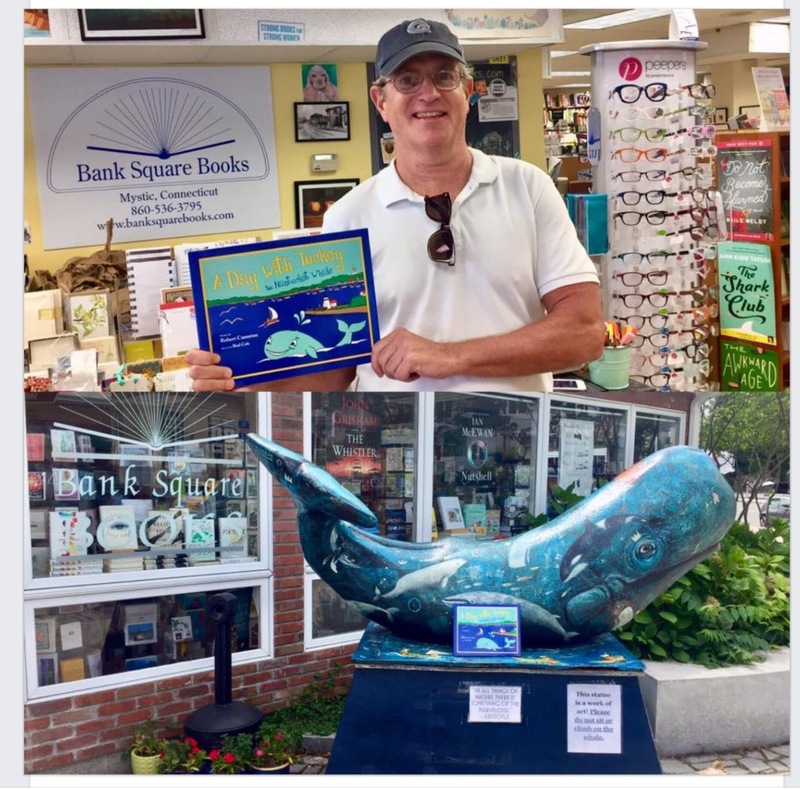 He’s a newcomer to the Faraway Land and the star of a new Nantucket children’s book, A Day with Tuckey, the Nantucket Whale, written by long-time summer resident, Robert Cameron, and illustrated by Rod Cole. Spend a beautiful, sunny, summer day with Tuckey as he patrols the serene inner harbor, making sure the waters of the crescent shaped island from Great Point to Madaket are kept safe and clean. As you flip through the brightly colored pages, you’ll be sure to encounter Nantucket’s infamous Rainbow Fleet, a school of flying fish eclipsing Sankaty Head Lighthouse, and the story wouldn’t be complete without the steadfast Eagle crossing the Sound. You’ll also meet a curious seagull named Freddy, Tuckey’s good friend, who’s excited to show you the hot spots around the Island. Then as the sun sets over the coastline of the North Shore and only the cries of seagulls can be heard, it’s time for Tuckey and Freddy to say, “good night.” But not to worry, Tuckey and friends will return first thing in the morning to take you on yet another island adventure. 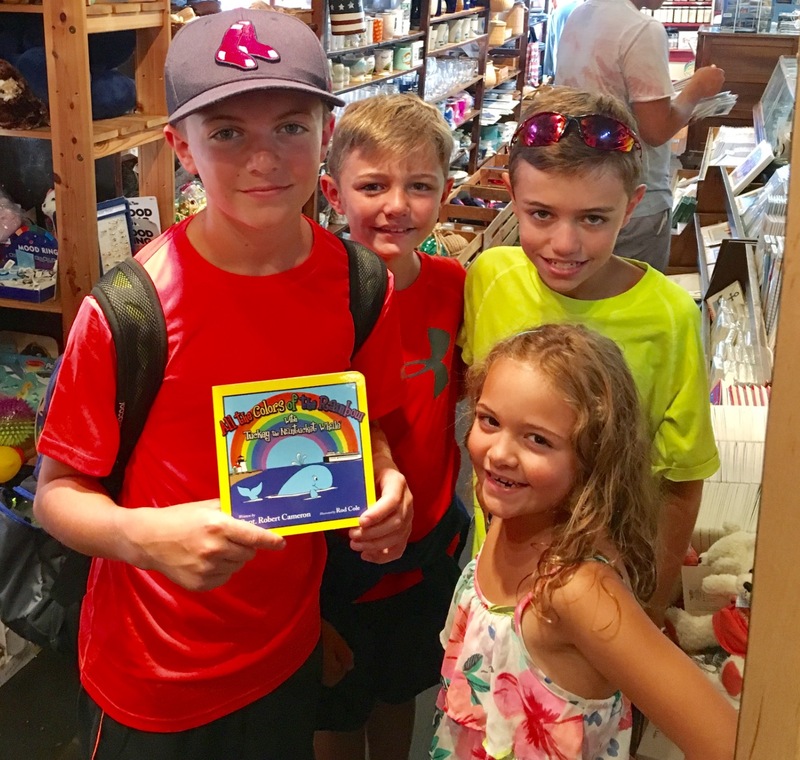 Cameron writes a sweet tale introducing young readers of all ages to some of Nantucket’s historic landmarks (I think we can officially say The Juice Bar is one of them!) while conveying a message of environmentalism around the pristine waters of Nantucket. For more than 25 years, Cameron was an accomplished sea captain commanding ships around the globe. “During those years,” recalls Cameron, “I was fortunate to have seen whales off the coasts of Australia, New Zealand, South Africa, Japan, and California. 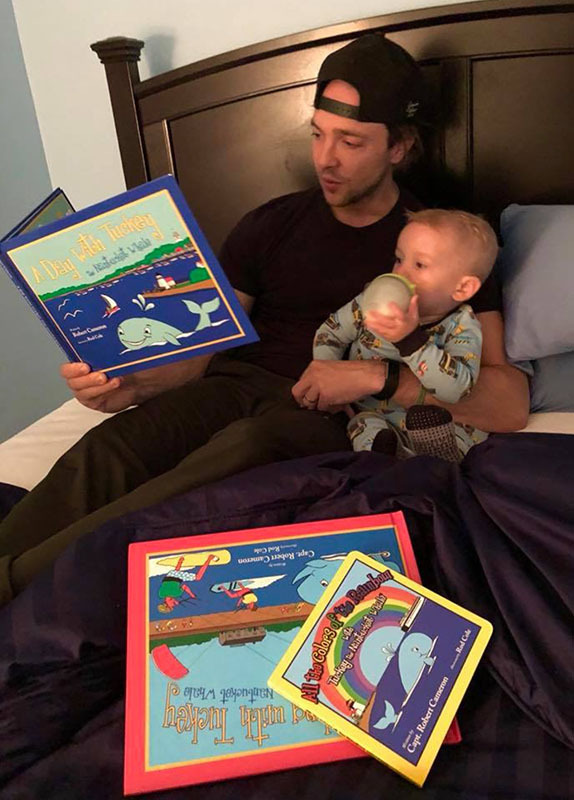 But the most spectacular whales were right here in the Nantucket waters.” This is Cameron’s first children’s book inspired by his many years at sea, his love of Nantucket and, of course, his two young Grandsons, Jakob, age 4 and Nathan, age 2. “This is a story that I have wanted to write for years,” says Cameron. Cameron and Cole spent this past winter collaborating on this project. Cole, a good friend of Cameron’s, has spent more than 40 years on the island and his passion for painting is evident in his illustrations throughout the book. But one of the main reasons why Cameron decided to dive into the deep waters of writing was to keep his brain active. In 2005, Cameron was diagnosed with a rare neurological condition called Superficial Siderosis (only 200 people world-wide have been identified with this condition). 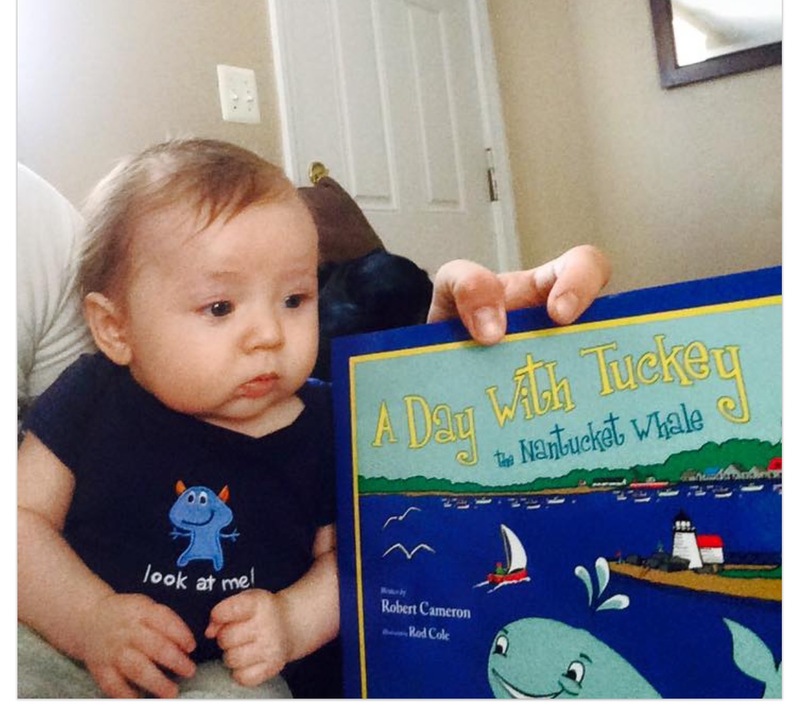 Tuckey has been instrumental in keeping Cameron’s mind active while battling this illness. These whimsical friends have also helped Cameron maintain a sense of humor and they continue to keep a smile on his face through all of his treatments. 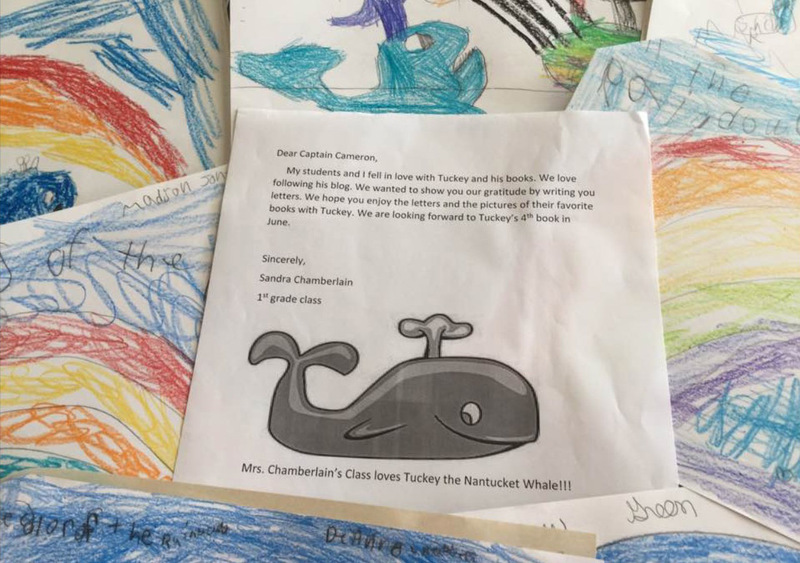 “My wish,” says Cameron, “is that all the children on Nantucket will enjoy Tuckey!” Cameron has outlines written for six more books to come and hopes to see this develop into a series. 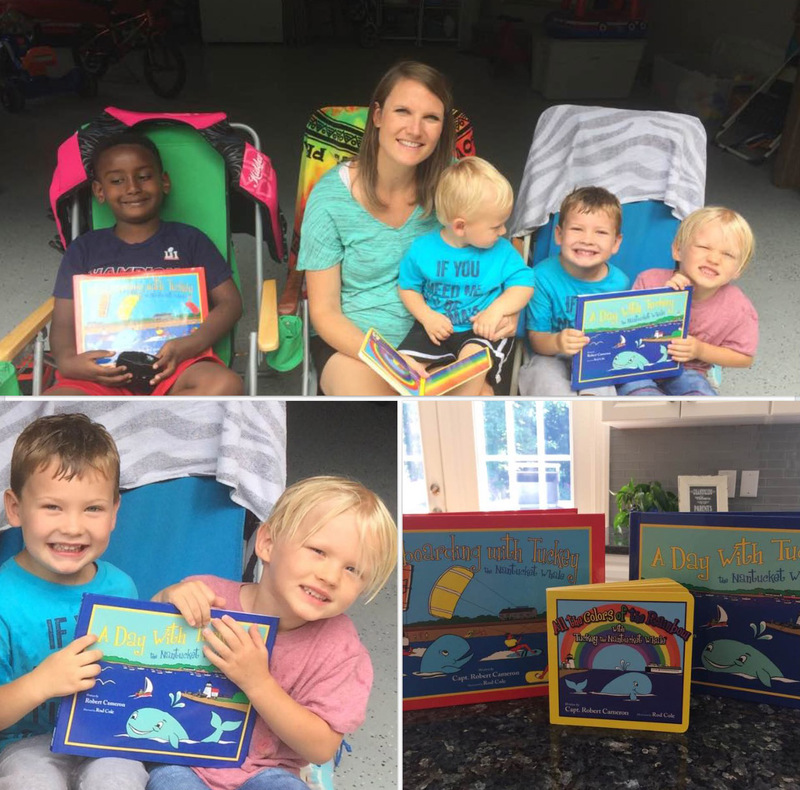 Jenny and her family love the Tuckey books! Our grandkids have loved them. Last weekend we took two of the kids to the beach and one asked me if I thought we would see Tuckey. 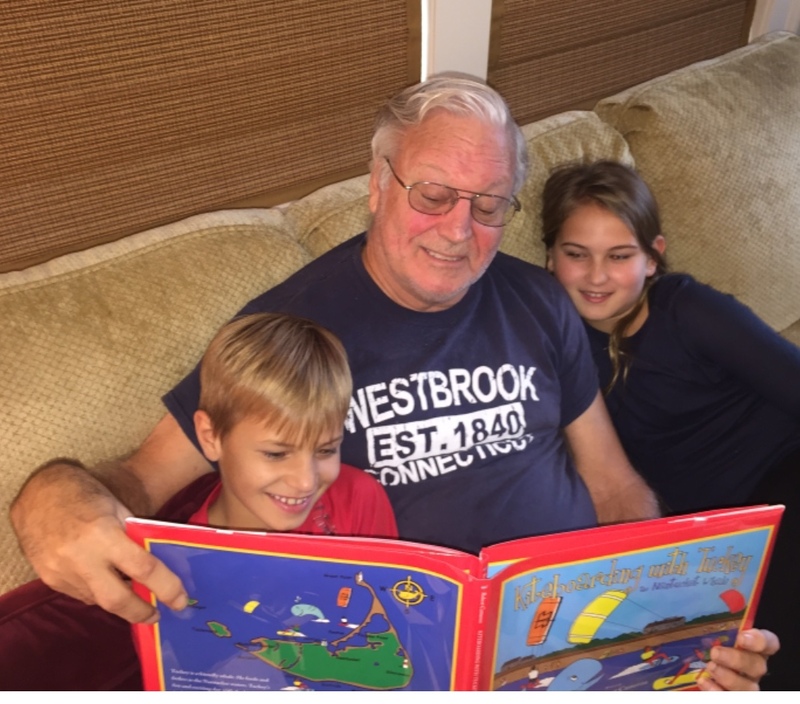 Enjoying Tuckey books with Grandpop! 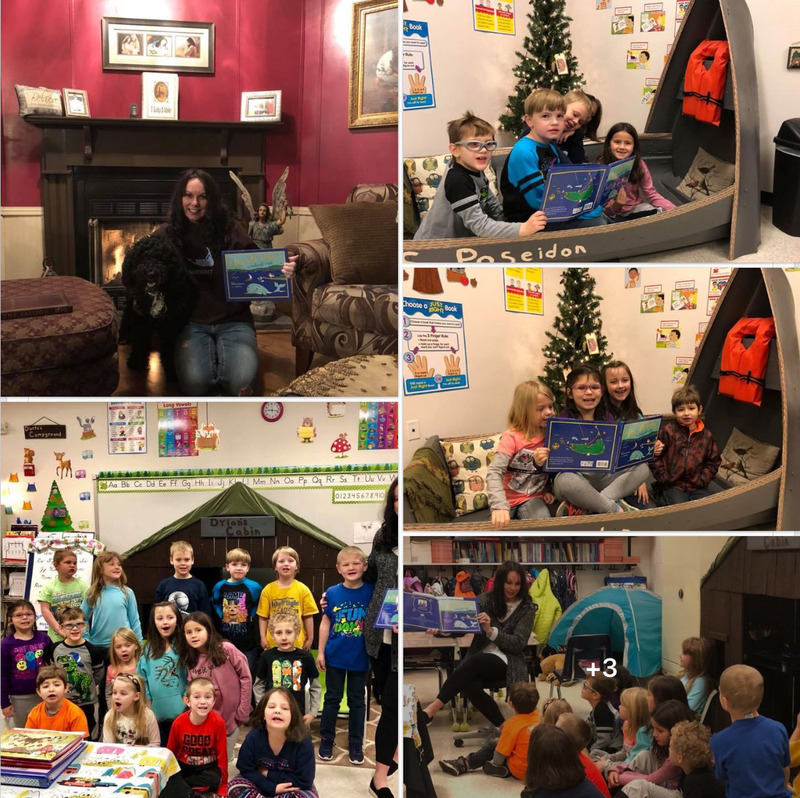 These kids love their new Tuckey book! Enjoying reading Tuckey books with Annie! 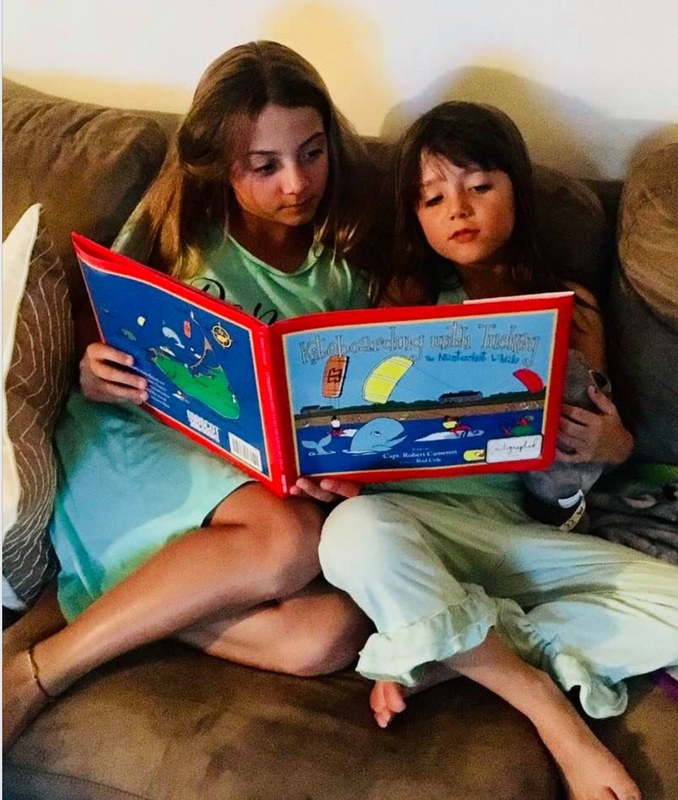 Paige & Maddie all comfy & cuddled …reading their new Tuckey book! Go Tuckey! 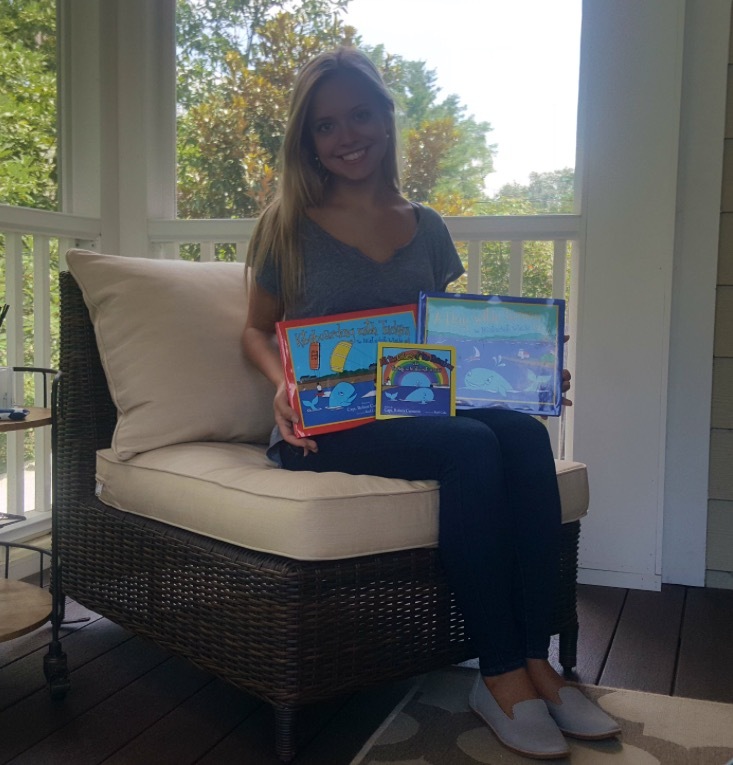 Tuckey books are a favorite for Annie…..during reading sessions to the children she is nannying this summer! Kiteboarding With Tuckey is a well written children’s book with beautiful illustrations. The author is my good friend Captain Robert Cameron. I highly recommend this as a gift for your kids or grandkids. Warner loved it!! 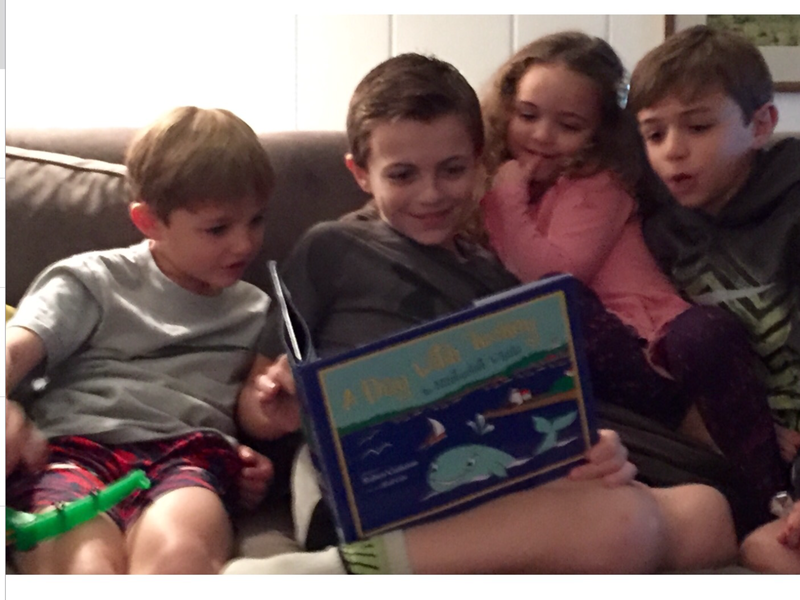 Kids love for Annie to read them a Tuckey book! 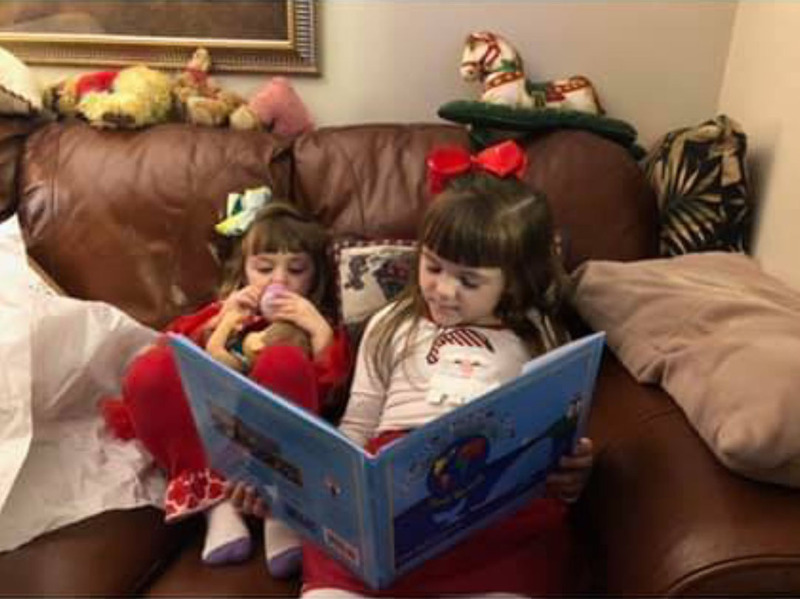 They love their Tuckey Books! I moved to mainland from Nantucket 4 years ago. 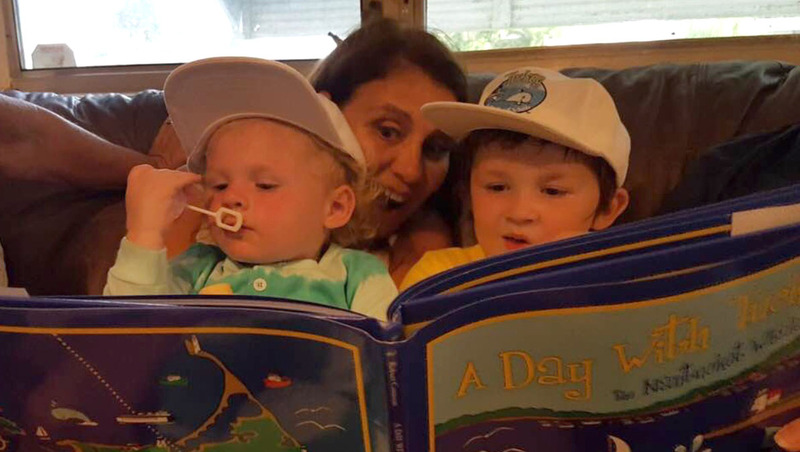 It’s nice to read Tuckey books to my grandsons Ronan and Wesley. Beautiful stories!! Happy Thanksgiving. Congrats, they are lovely books with great messages! 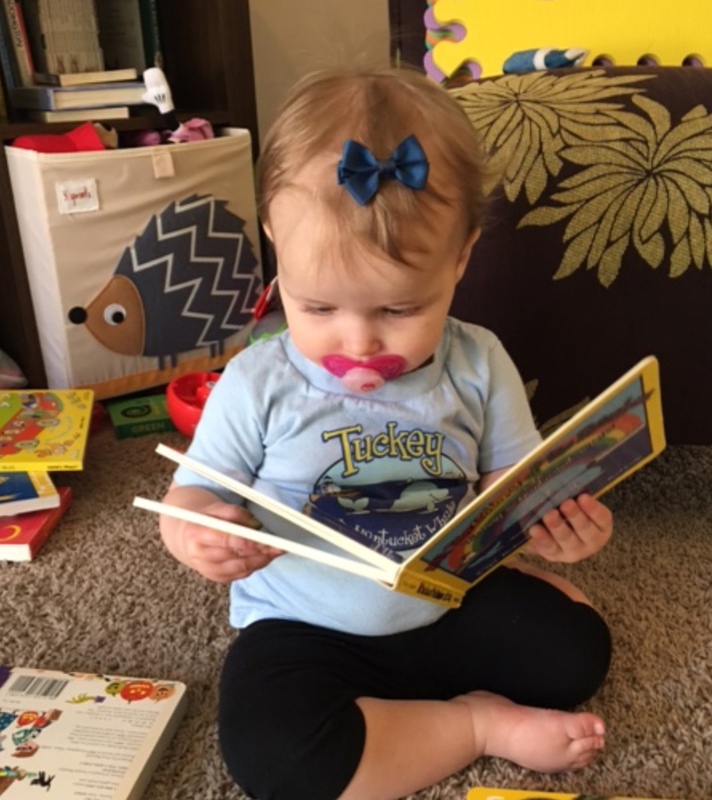 You are right, I ordered all the books for both granddaughters and I am not kidding, that is their go to book at bedtime, they absolutely love Tuckey!! I am going to take pics and send them to you! 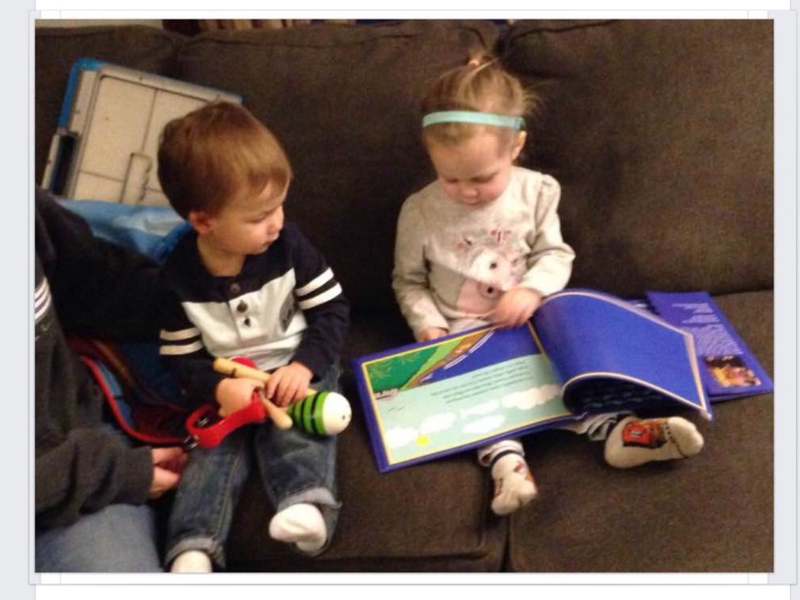 Another family loving their Tuckey Books! Everyone loves Tuckey! Blowing Bubbles and Reading About Tuckey! Great Stuff! 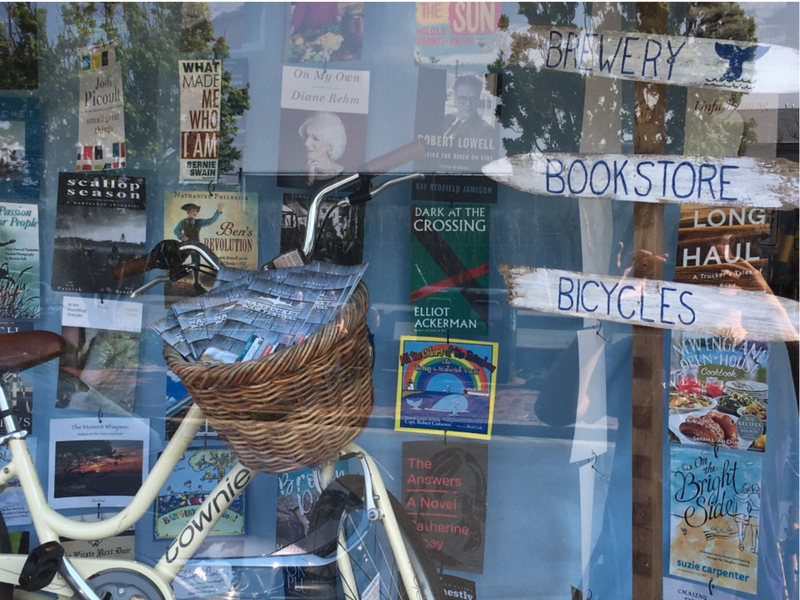 Tuckey's book in the window with other great books highlighted at the Nantucket Book Festival June 2017! What a wonderful photo! Dylan pointing out her favorite whale to her Grandpa. Tuckey the Nantucket Whale! Go Tuckey! 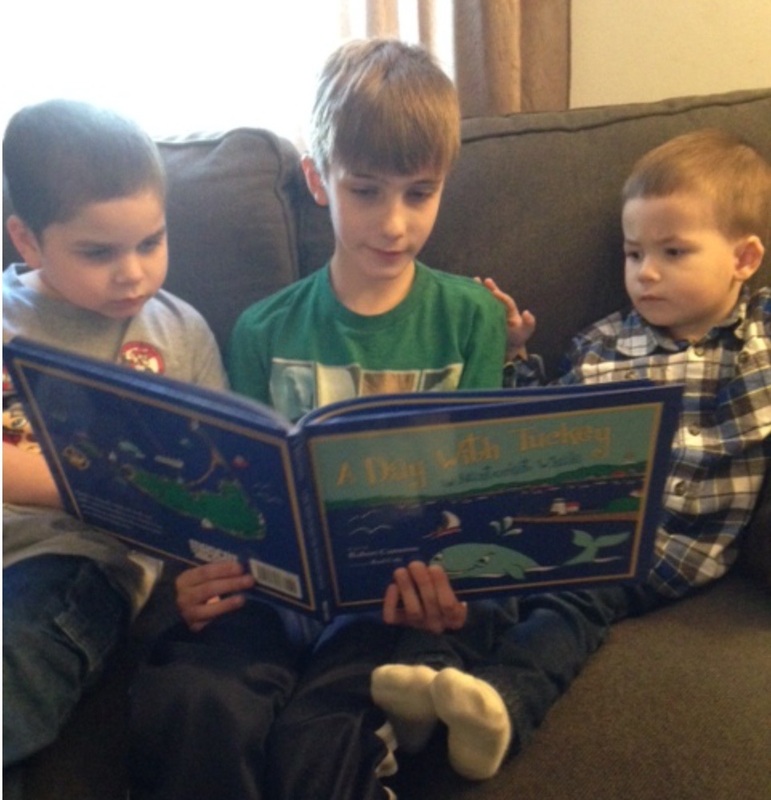 Big brother reading his Tuckey book to his younger brothers! Kennedy wants me to come back and read again Loi She said “Mommom you still have one more Tuckey book.” I wanted to wait till June but not sure that will happen. The kids love your book Bob! 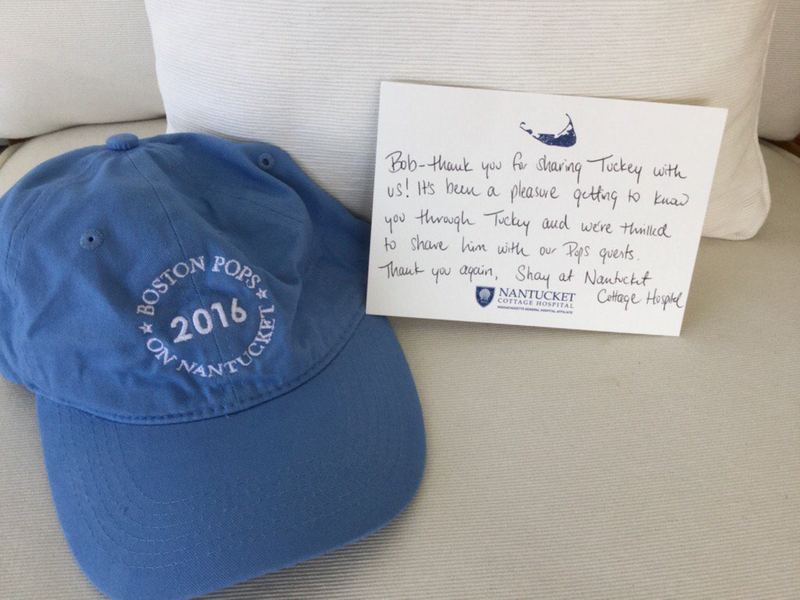 Sharing Tuckey With The Boston "Pops" on Nantucket! 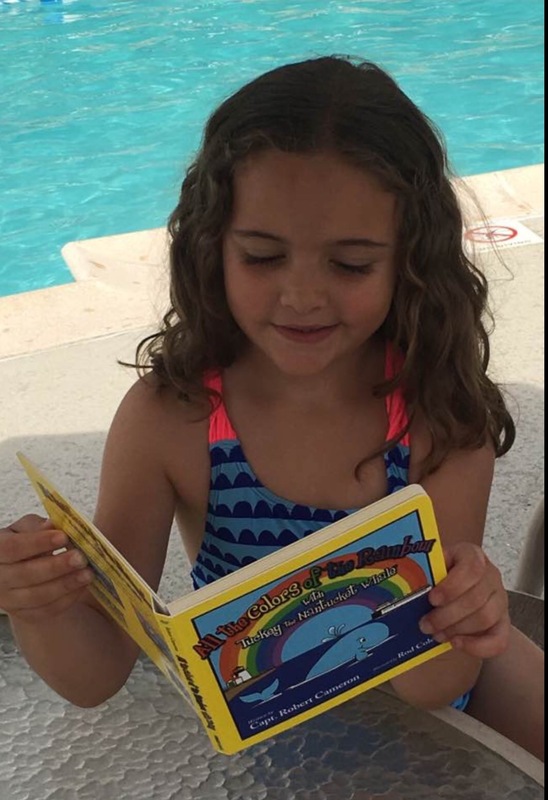 Mallory having some quiet time....reading her Tuckey book “All the Colors of the Rainbow With Tuckey The Nantucket Whale”. Go Tuckey! Another Tuckey Fan! 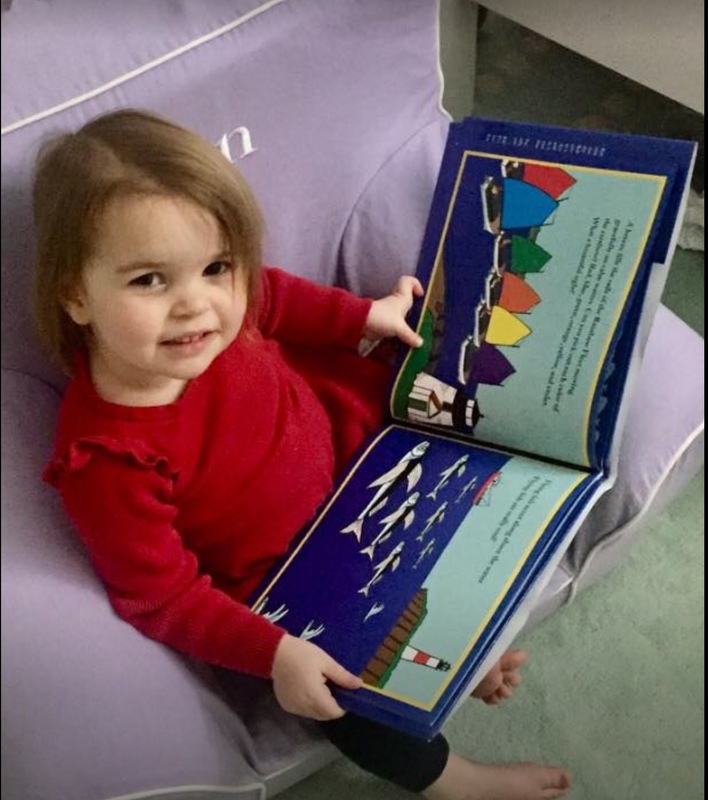 She loves her Tuckey book! 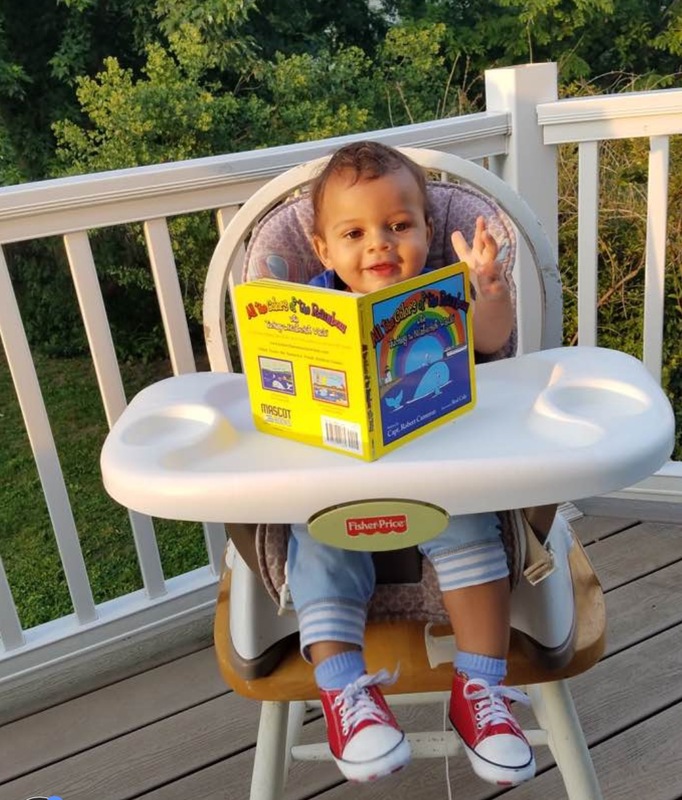 Raina loves her Tuckey book! Elliana and Maya have requested it as their bedtime book just about every night since we got our copy. 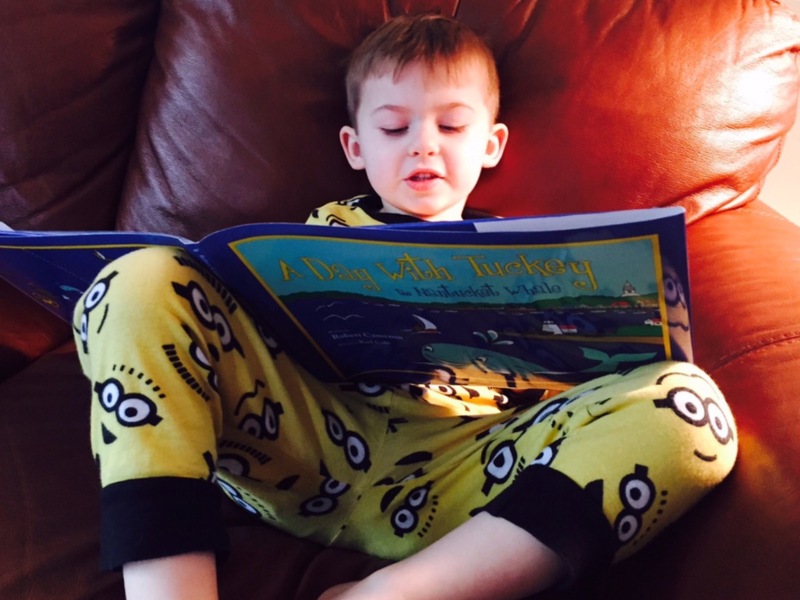 We look forward to reading more about Tuckey and his adventures in the future. 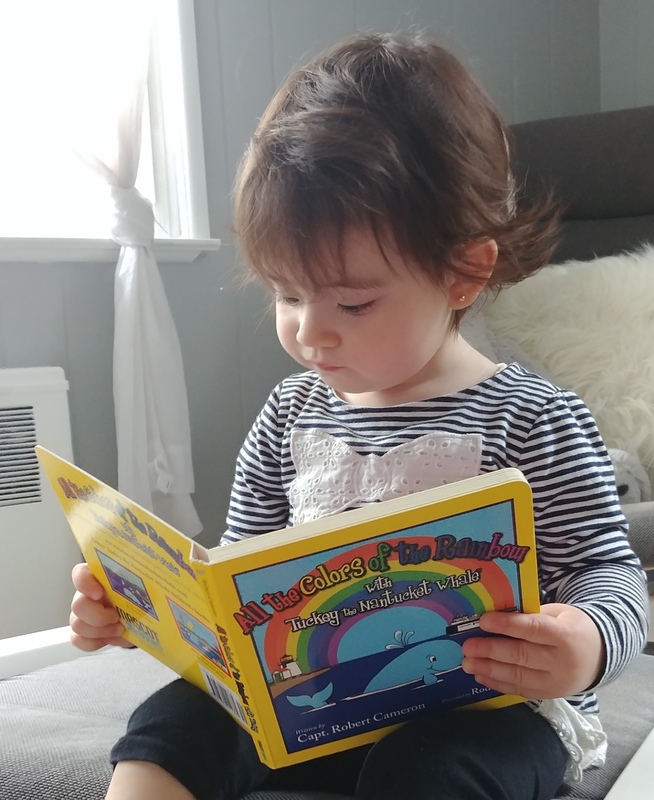 Everyone loves reading about Tuckey the Nantucket Whale! 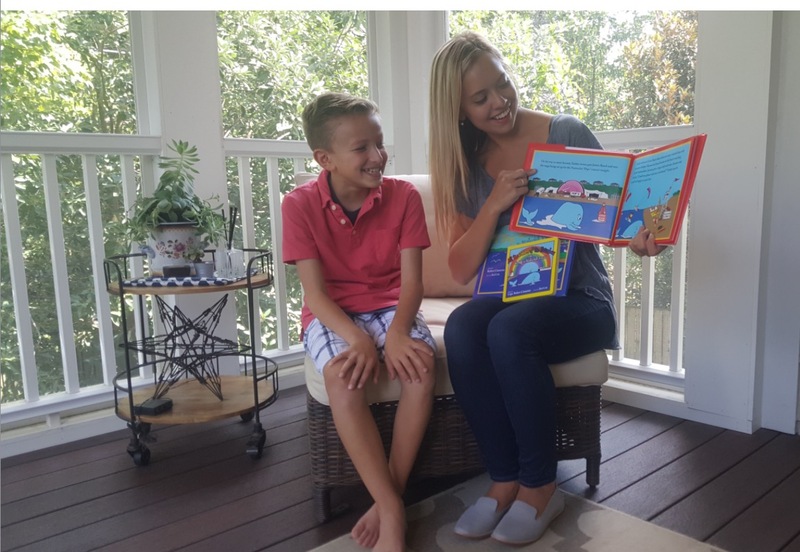 KITEBOARDING WITH TUCKEY THE NANTUCKET WHALE is the second book in Captain Robert Cameron's Children's Book Series about Tuckey, a friendly whale that lives and plays in the waters around Nantucket Island. This story is about a day spent with Tuckey as he shares with us his kiteboarding skills and adventures, a very popular activity around Nantucket Island. As you would expect, Tuckey is an avid kiteboarder and is anxious to show his friend Scooter how to kiteboard. Tuckey does a super job teaching Scooter and is very creative fixing some of Scooter's kiteboarding equipment when it breaks! As the day ends, Tuckey and a few of his friends swim to Jetties Beach to watch, listen and even dance to some of the music of the Nantucket Pops in their charity performance for the Nantucket Cottage Hospital! Once again, colorful illustrations by Rod Cole meld and flow into the story encouraging interaction with the reader as Tuckey plays, splashes and kiteboards around Nantucket Island. 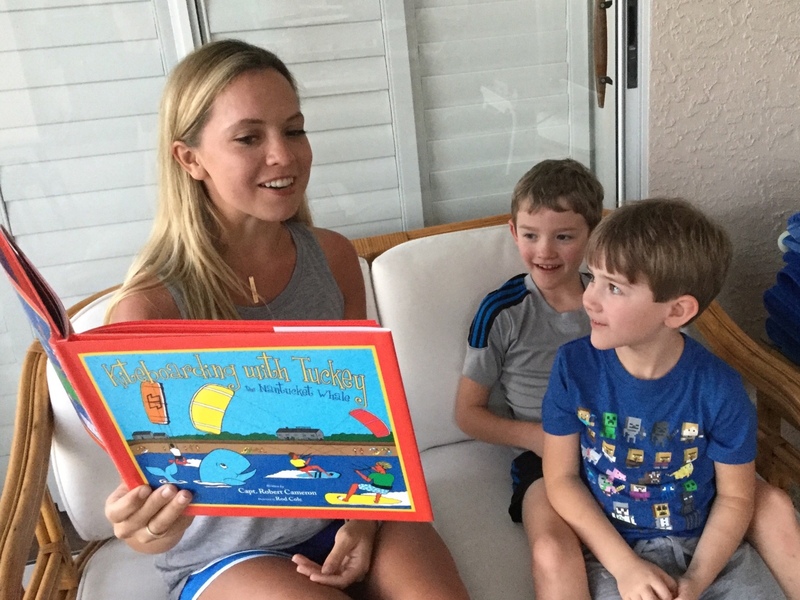 KITEBOARDING WITH TUCKEY THE NANTUCKET WHALE is a book for all ages and one you will read to your children and grandchildren again and again. It is a happy story that leaves you feeling good with a whale-sized smile on your face! Love reading my Tuckey book! 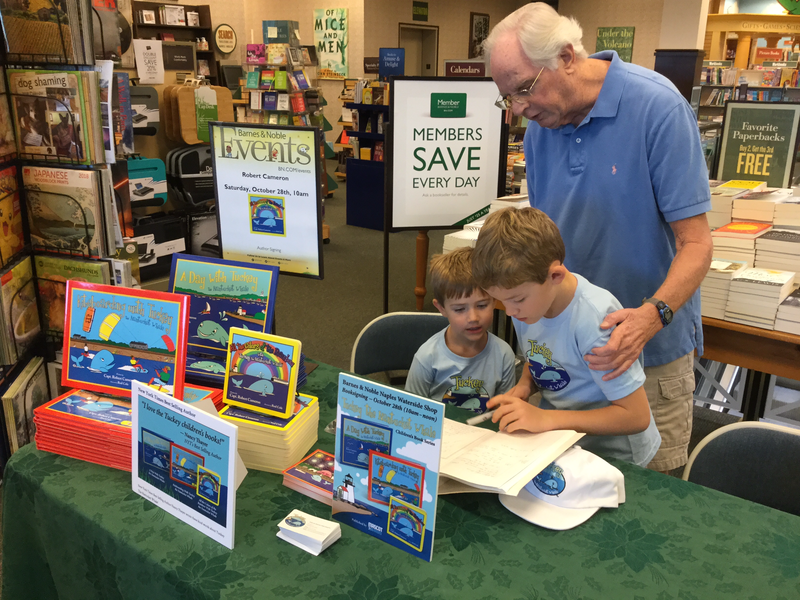 Tuckey’s “Best Boys” helping Grandpop at Booksigning! Just spotted Bob Cameron's delightful children's book at this Historical Downtown Mystic bookstore. 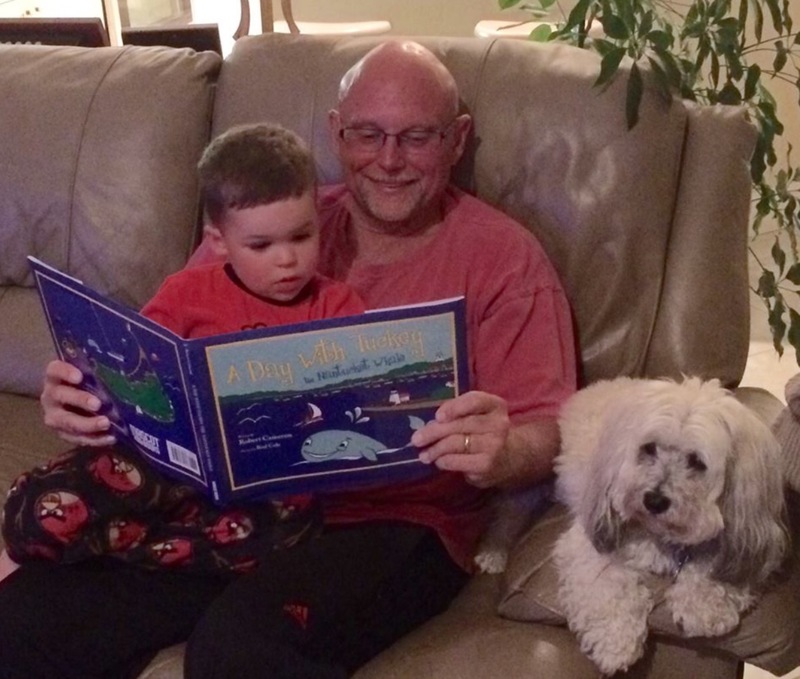 My 5 year old grandson loved Tuckey. Now he wants to meet him! My 5 year old grandson loved Tuckey. Now he wants to meet him in Nantucket. We also sent a copy to our 5 year old granddaughter in Florida and her 9 year old big sister read it to her! They both loved it too. The story is well presented and informative. The illustration is bright and colorful. My daughter in law wants to use it in her second grade class for a geography lesson. Great job! We are all waiting for more Tuckey stories. Tuckey the Nantucket Whale children’s books are right up there with the other children classics! 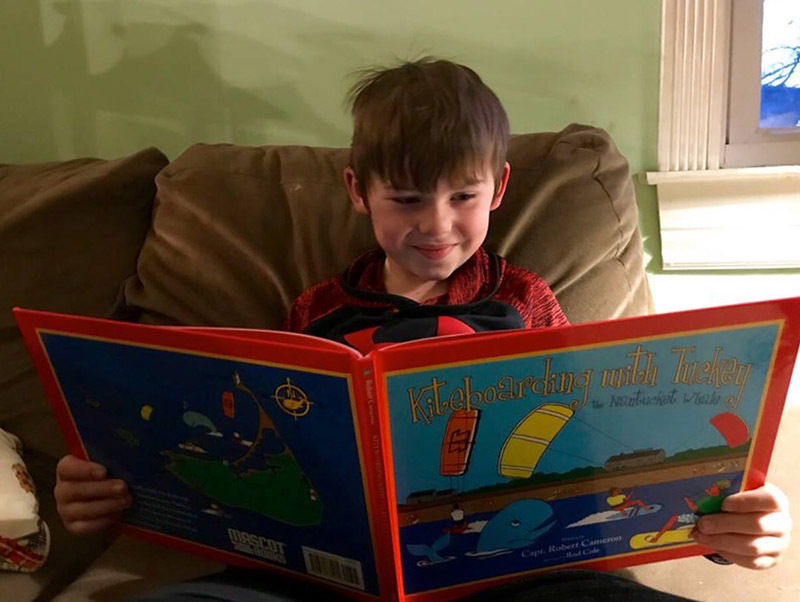 Arthur is so happy, he just received his Tuckey book! 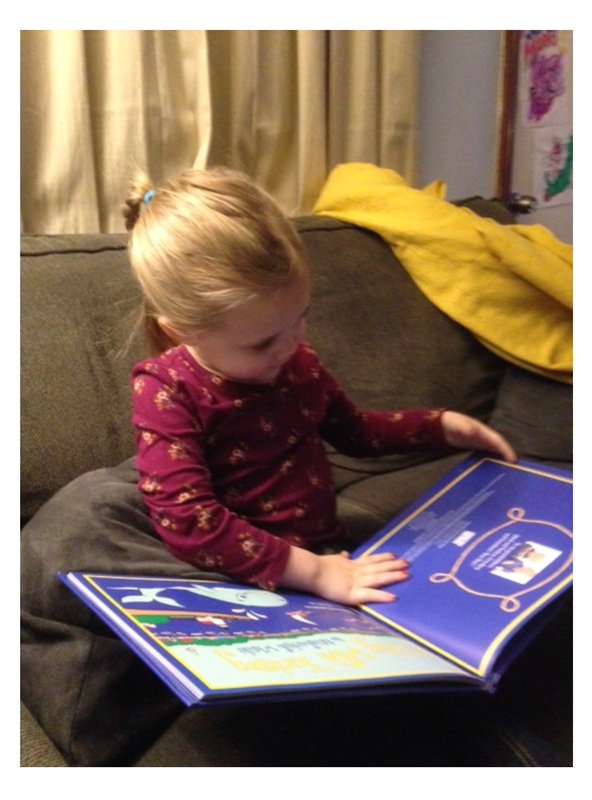 Morgan loves her new Tuckey Book! Tuckey is a young, friendly whale that swims and plays in the pristine waters around Nantucket Island. 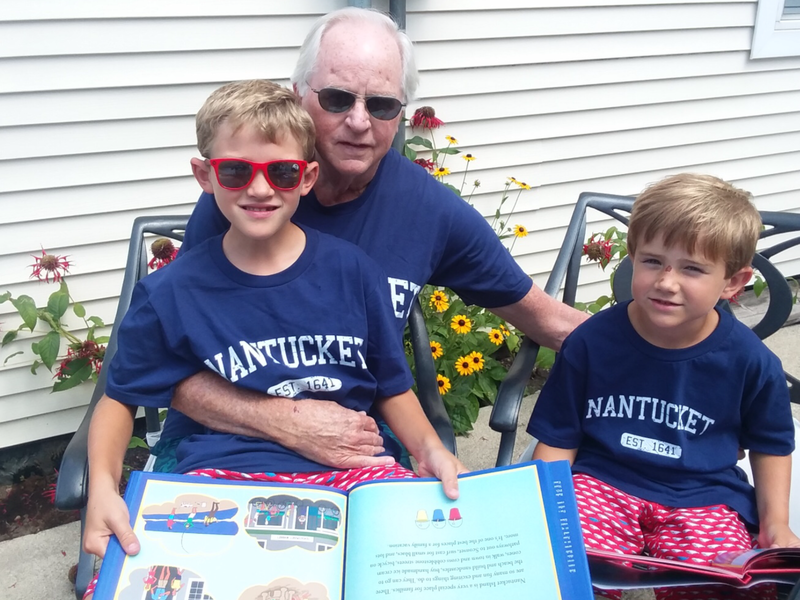 This children’s book is a story of how Tuckey spends a typical day visiting with his friends and watching some of the exciting activities taking place in Nantucket. Tuckey also shares the importance of following rules, safety and keeping his waters clear and clean. Colorful illustrations meld and flow into the story encouraging interaction with the reader as Tuckey points out sailboats with different bright colored sails, busy fishing boats, the Nantucket Ferry with excited families and pets coming to Nantucket Island, flying fish and his friends Freddy the seagull and Mr. Lobster. 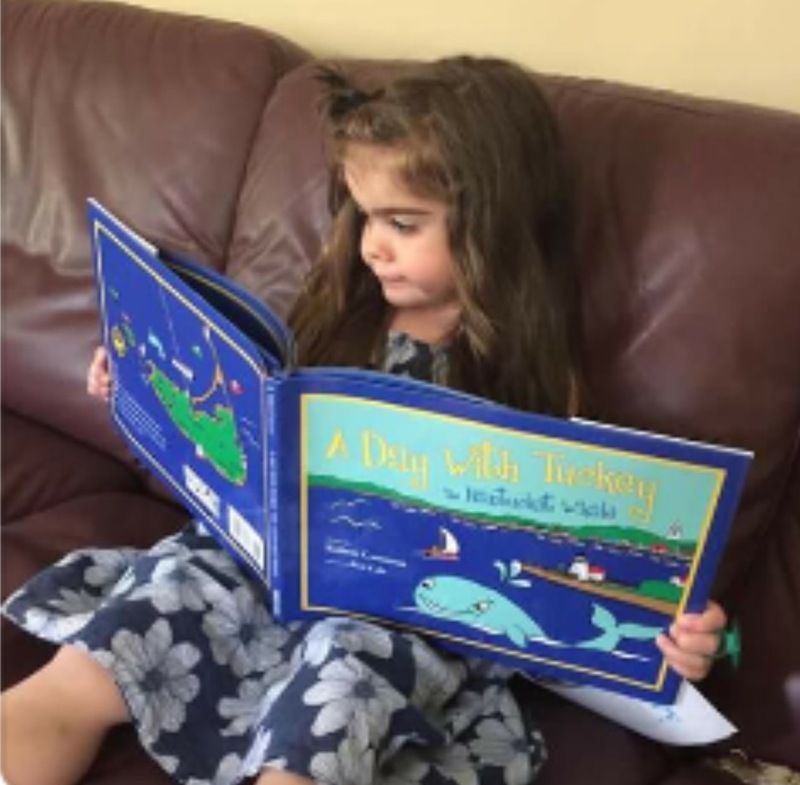 A Day With Tuckey the Nantucket Whale is a book for all ages and one you will read to your children and grandchildren again and again. It is a happy story that leaves you feeling good and with a whale-sized smile on your face! 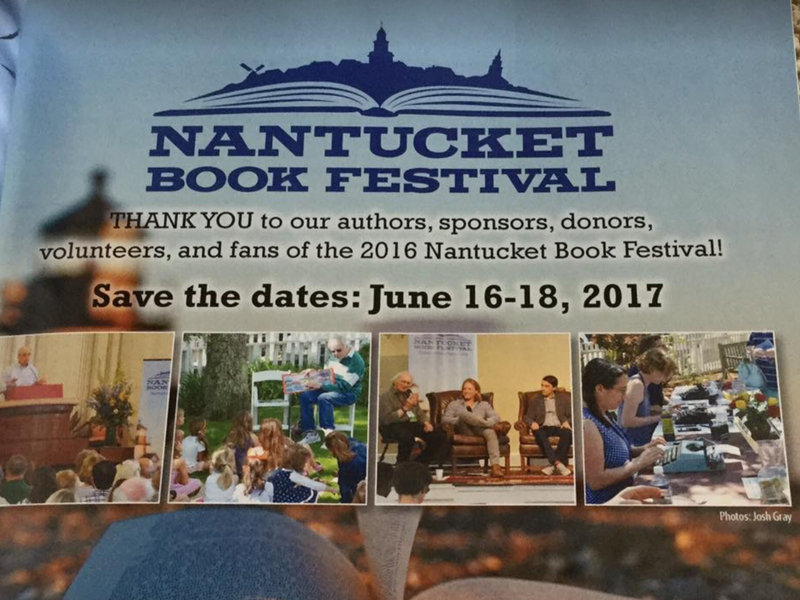 I can’t wait to read Captain Cameron’s next story about Tuckey the Nantucket Whale and his adventures Kiteboarding! Carolyn loves her Tuckey book! 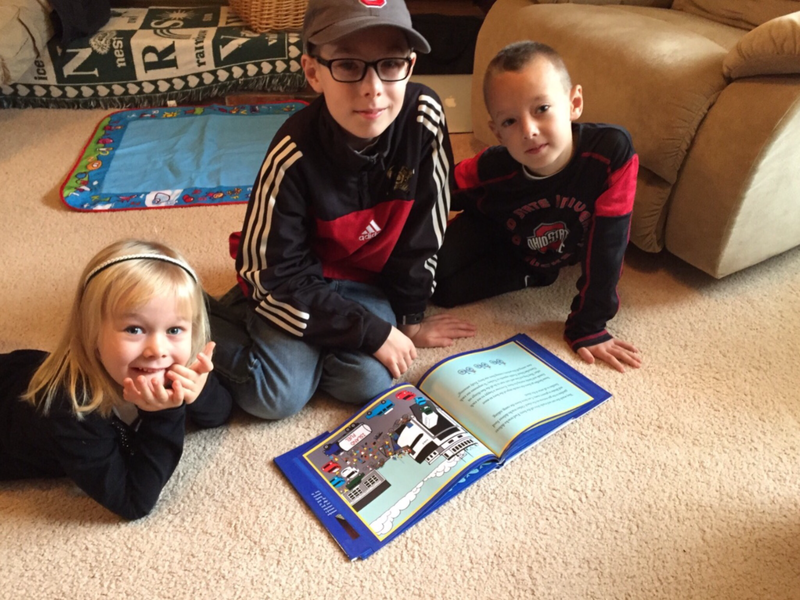 5 out of 5 stars – Great book for the grandkids! I bought this for my grandchildren. I am looking forward to taking it and reading to them in a few days. The story is so charming and is complemented by the wonderfully colorful artwork. I am looking forward to his next book. Reading her Tuckey book to her brother! My 7 and 4 year old grandchildren love the story and the illustrations in this book! It also has a wonderful message for the protection of the environment. I hope there will be more Tuckey adventures. 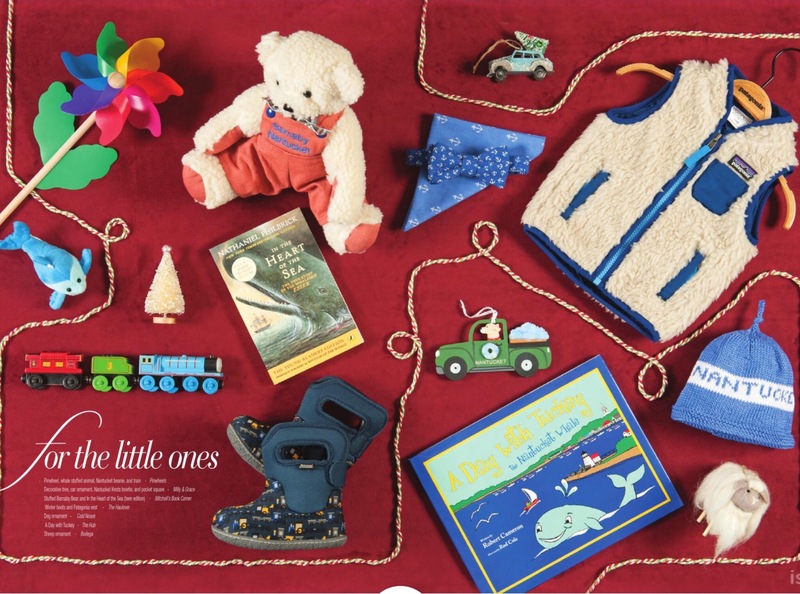 Tuckey made it into the Nantucket Magazine! 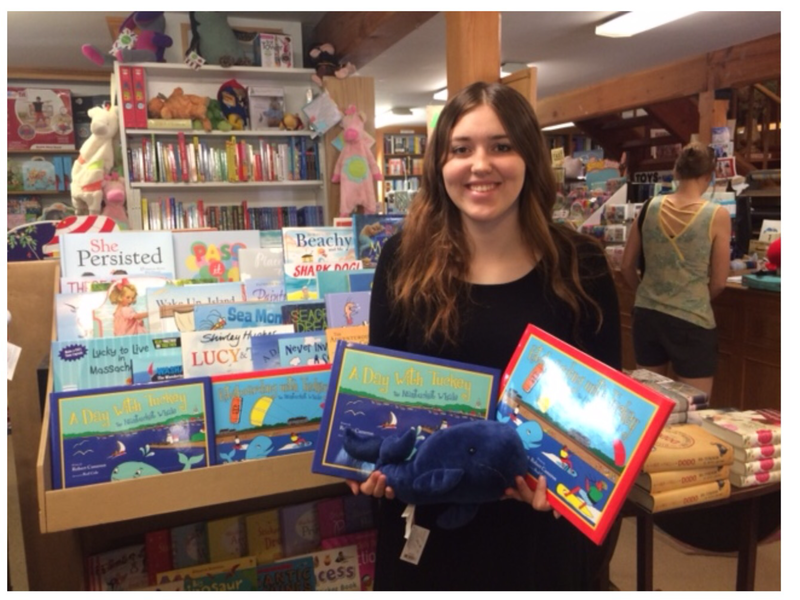 Tuckey's books are a big hit in this popular bookstore! Very well written. My Grandson who is 3 years old loved it!! Can't wait for more Tuckey adventures to follow. 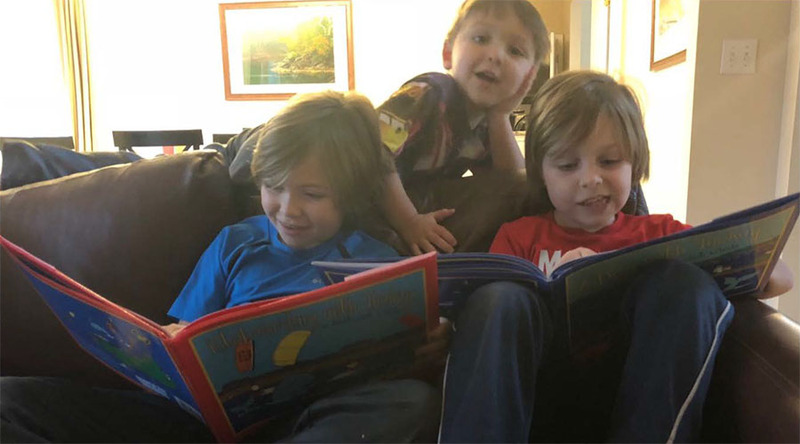 These kids just can't stop reading their Tuckey book! 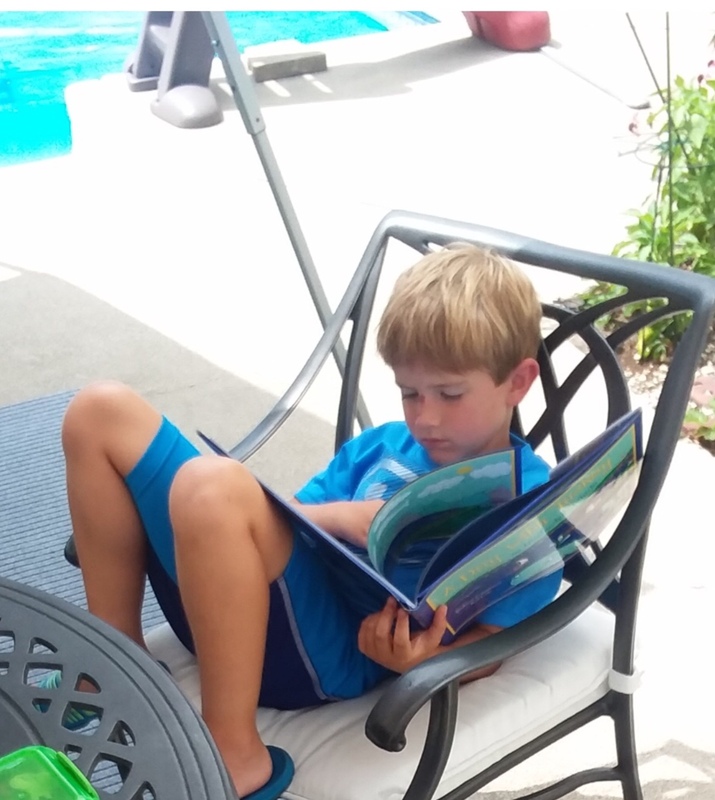 Chillin by the pool...enjoying his Tuckey book! 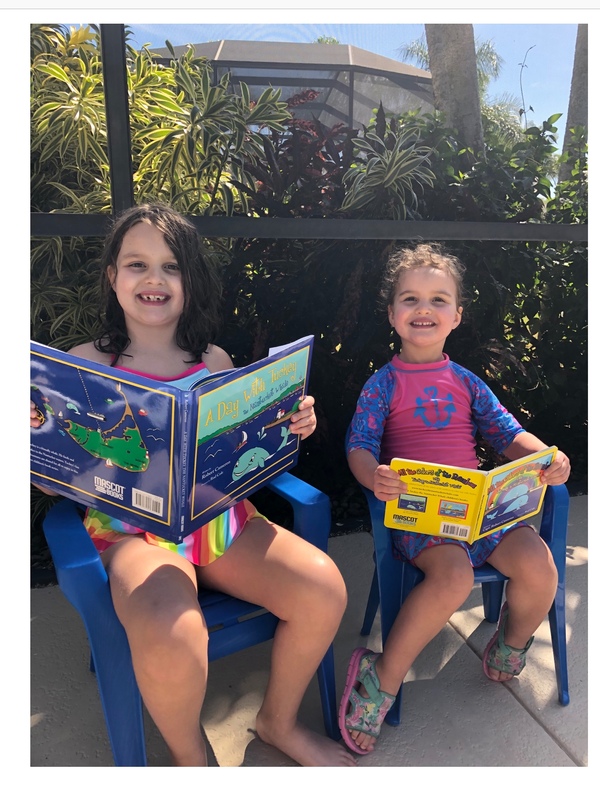 They love their Tuckey book! 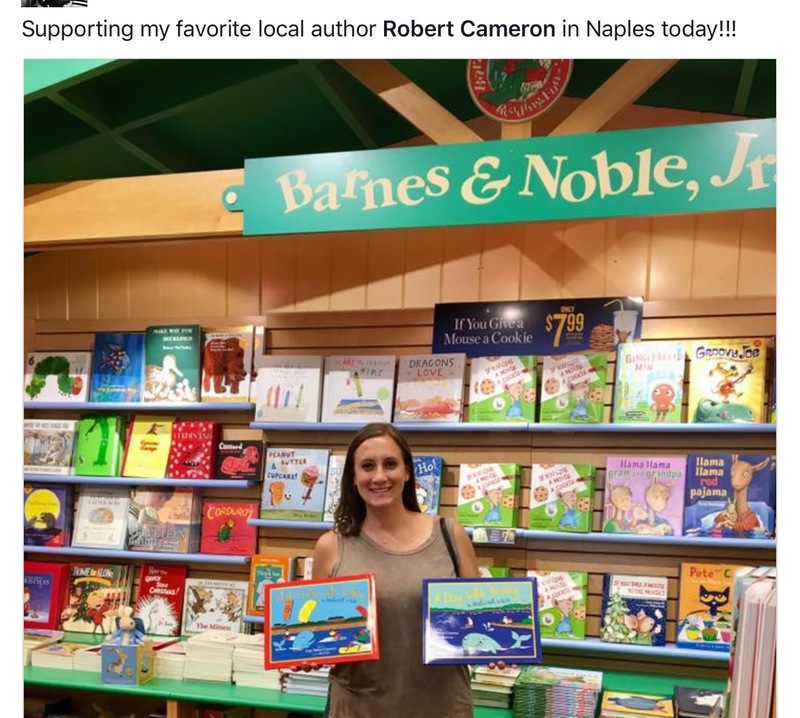 First-time author Robert Cameron came to Southwest Florida in 1997 primarily for the golf and the good weather, but has found himself at home in Naples, enjoying retirement in the area with his family and friends close by. 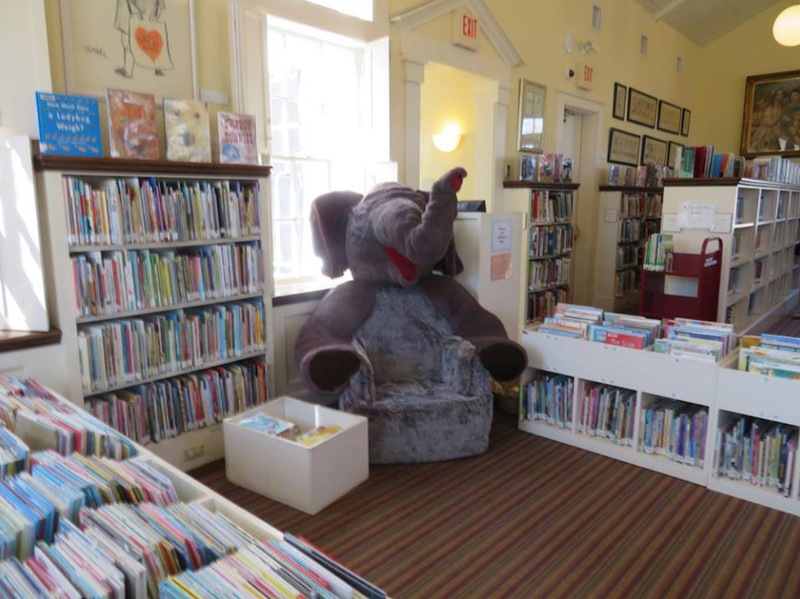 His debut publication, a children's book titled A Day With Tuckey the Nantucket Whale, was published in September and has gained popularity around the island of Nantucket, where he has a summer home. The book, written on a whim as a way to keep his brain active as he fought a rare illness, became an exciting project that he would like to make into multi book series. “I wanted to write a quality children’s book,” says Cameron. 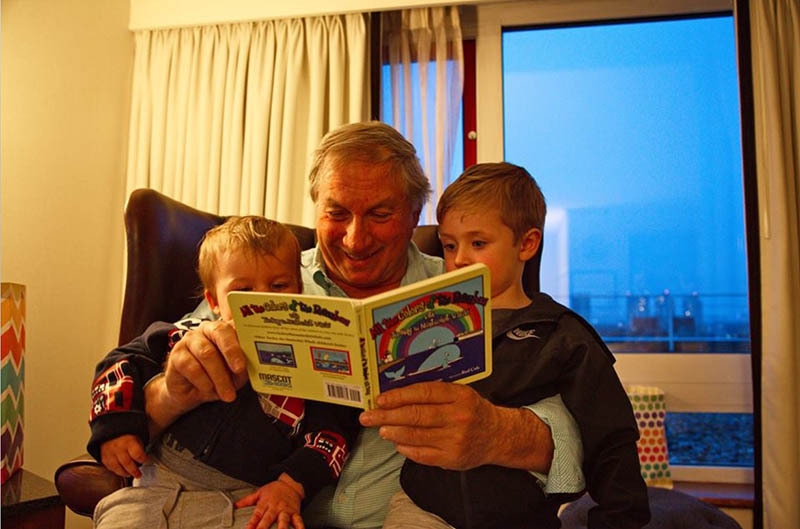 He has dedicated Tuckey’s adventure to his grandchildren, who helped inspire him to write it. You can find Cameron’s whale tale online (amazon.com) and in bookstores. 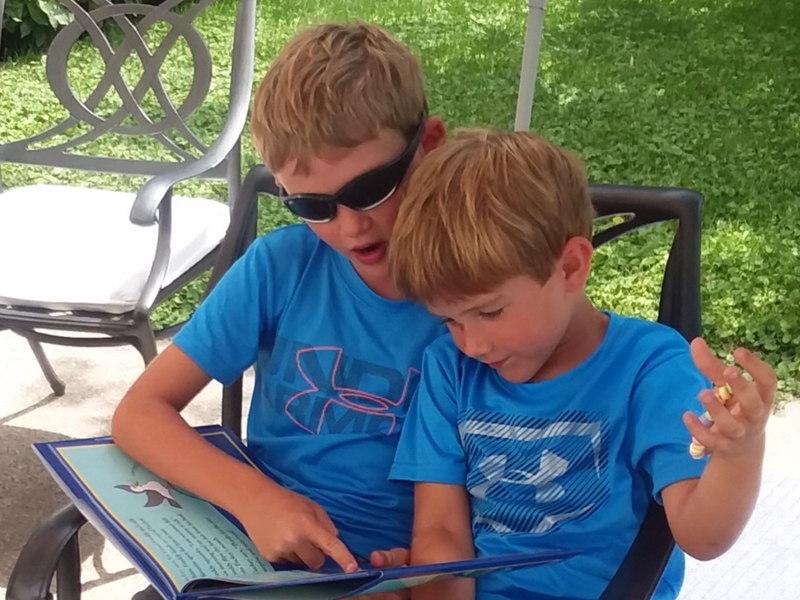 Nantucket Magazine highlights Tuckey's new book being read to the children on the Atheneum lawn!